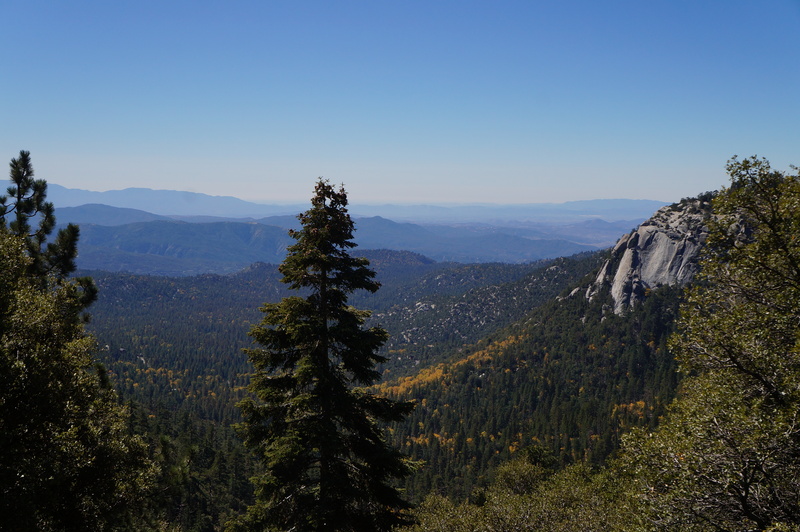 Group of friends wanted to relive the adventure and camaraderie of our weekend trip to Idyllwild last year. A charming and quiet mountain resort, it’s turning out to be a great destination to travel for us looking to get away from the city, stay in a cabin, hike, BBQ and be happy in each other’s company. And again, this turned out to be such a memorable trip. 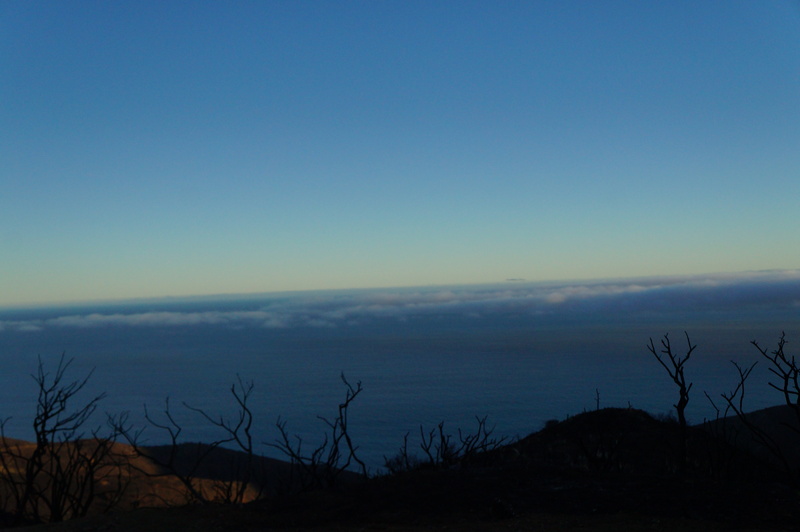 We chose to do a moderate hike on Saturday so we could be back before sunset and enjoy the beautiful view from our cabin. 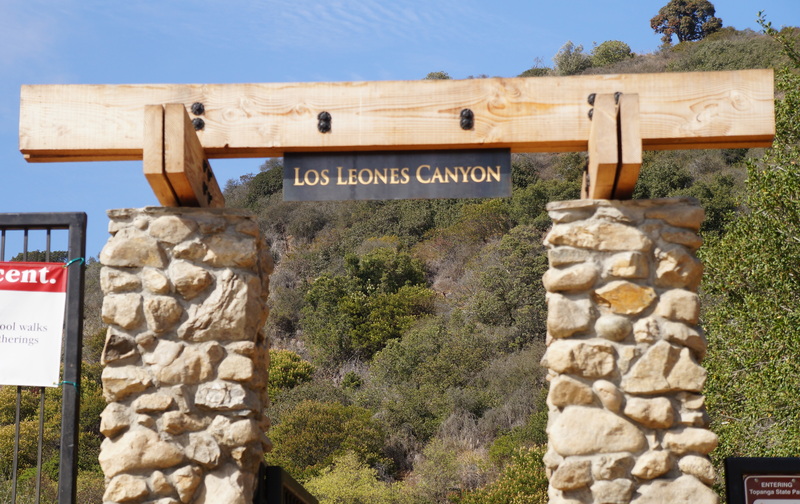 We needed to purchase a hiking pass from the ranger station who were helpful in providing us with trail options based on what we were looking for. 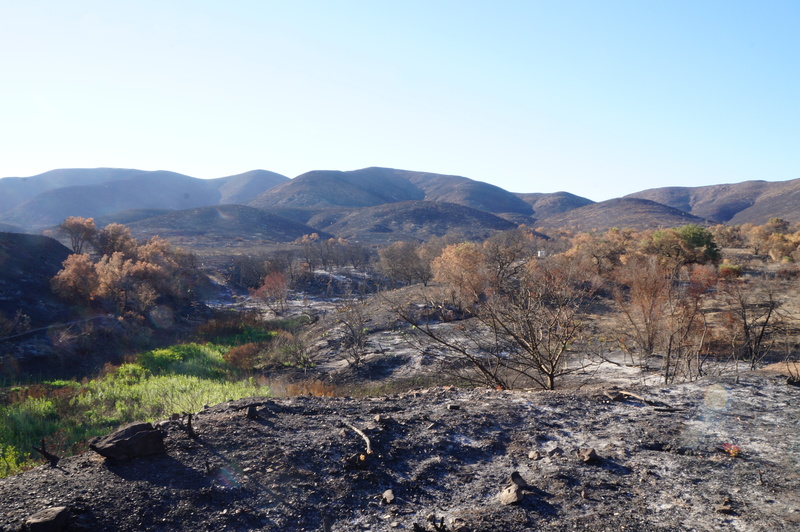 For those who hike in the dry forest area around Santa Monica mountains, this is a good change. We met very few tourists along the way – One of the main reasons why I love this place. Its not too empty to feel threatened but enough for it to be an escape. If you want a hike that’s more fulfilling but don’t mind getting really sore (at least I was last year), I would really recommend Deer Springs Trail. 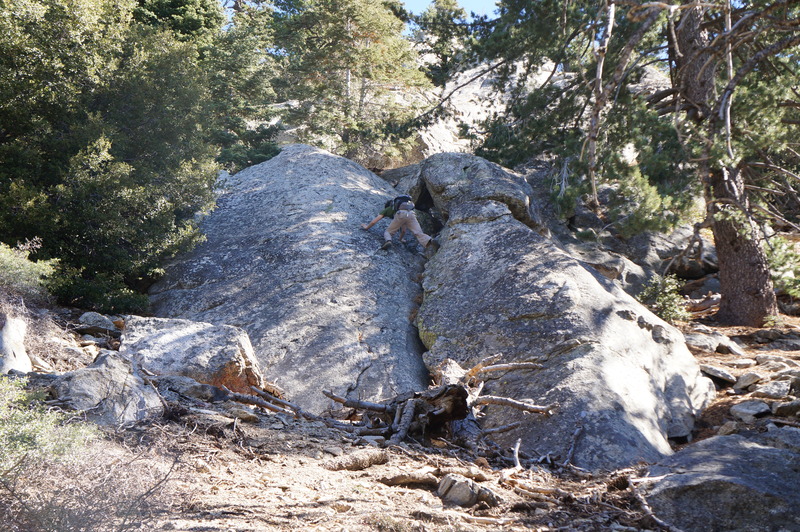 http://alltrails.com/trail/us/california/deer-springs-to-suicide-rock. 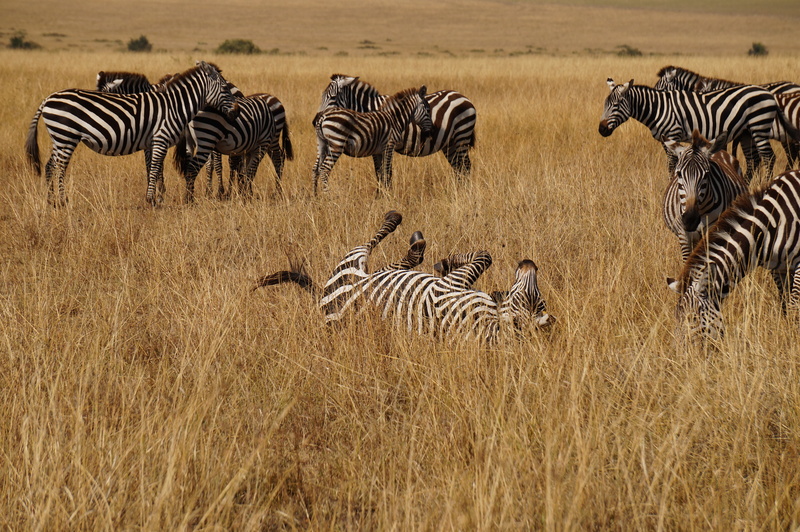 Maasai Mara, the very popular national park in Kenya, was the last stop in my African safari adventure. 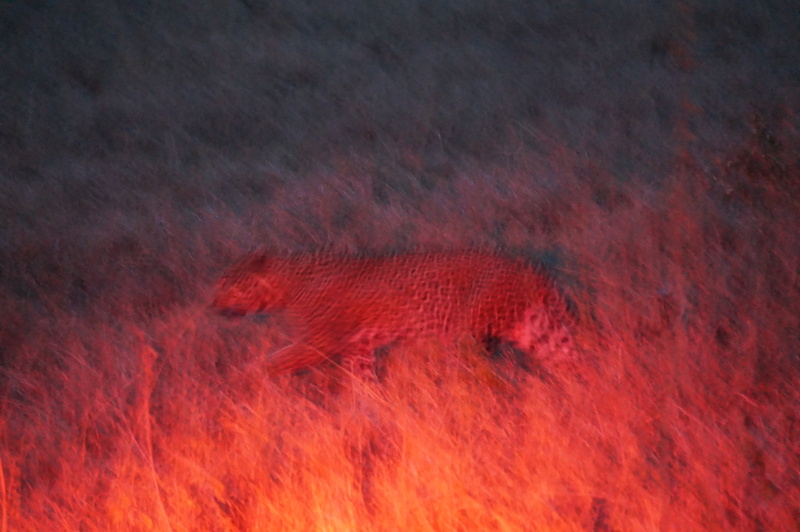 I saw plenty of wild animals especially big cats.. We even managed to catch sight of the elusive leopard! 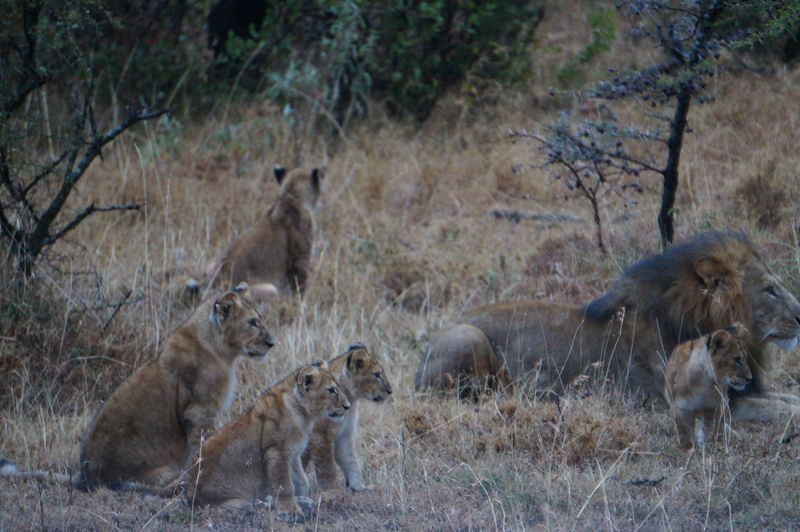 After landing on the air strip and settling in my room, I went for an evening game drive where we spotted a family of lions!! That made my day. 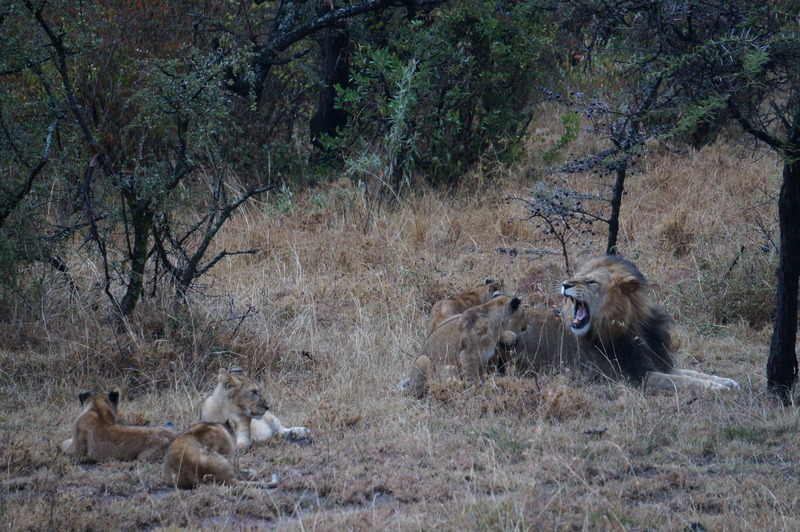 Funny and so relatable scene was when the cubs tried playing with the dad, he roared. 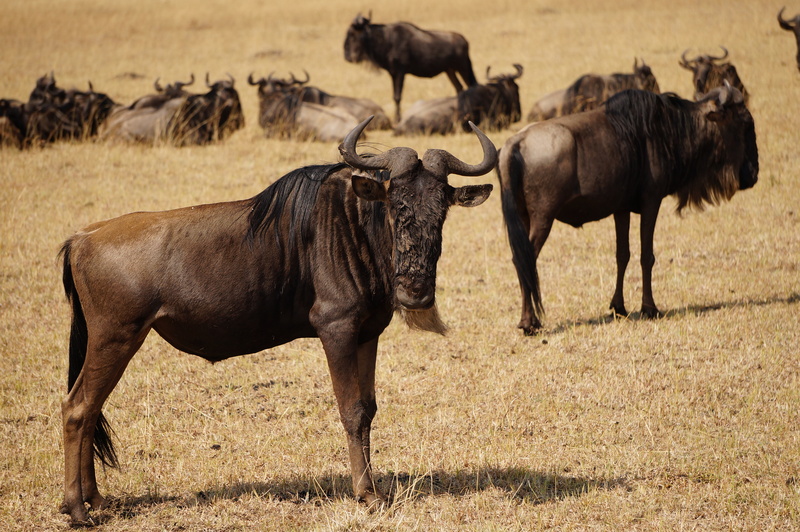 We started a full day game drive the next day, hoping to spot the famous wildebeest migration. 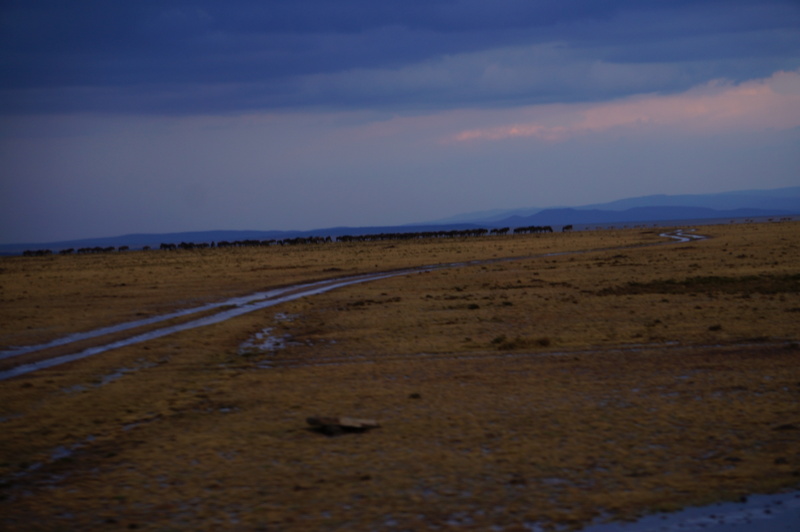 I didn’t get to see it though.. With the rains in Mara, they apparently changed their minds and the crossing was empty by the time we got there. That didn’t bother me much.. I heard so much about how the area starts to look like a crazy parking lot during the migration that I was pretty relieved. This is one of my favorite pictures.. I can imagine myself standing tall and taking in. 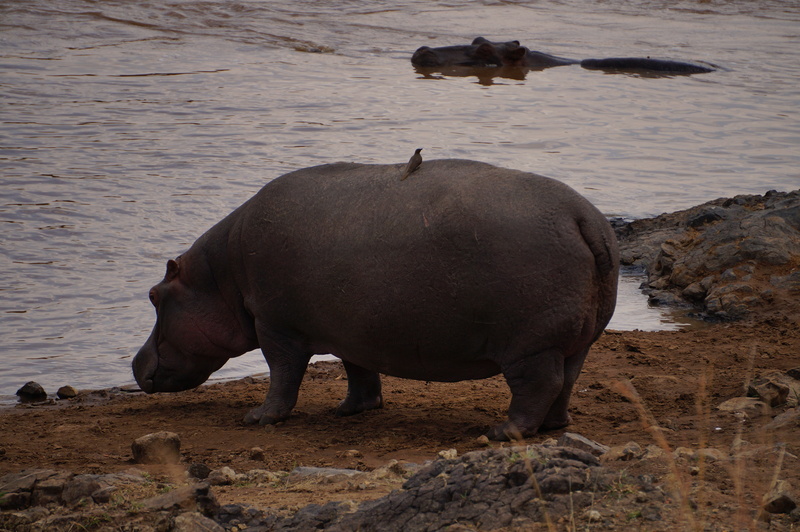 We spotted the very dangerous hippos near the mara river basin. 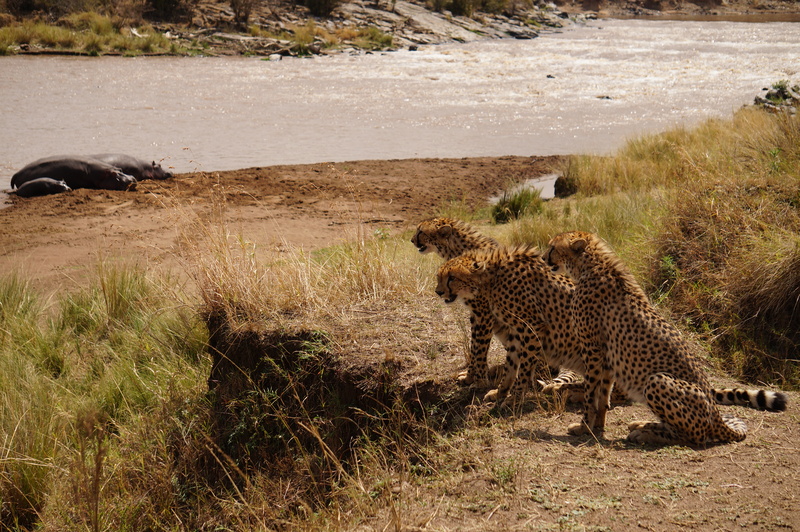 Finally spotted some cheetahs. 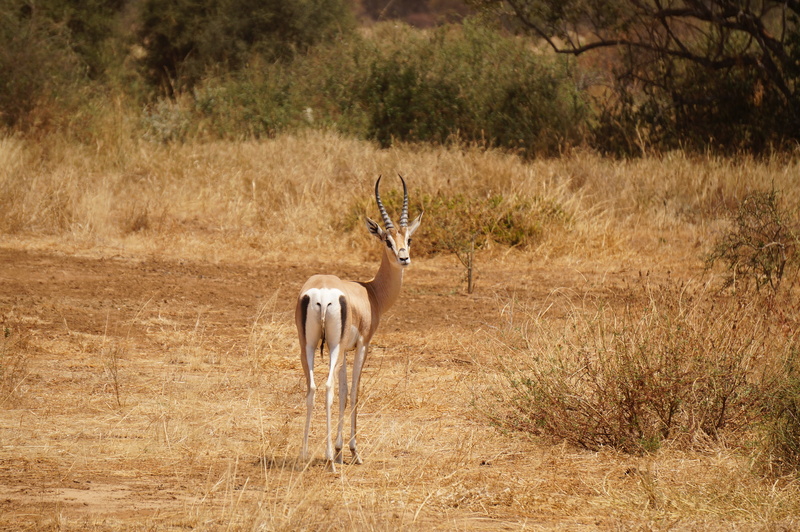 The very graceful creature has black tear marks around the eyes (and that is how I am going to remember to distinguish between a cheetah and a leopard). 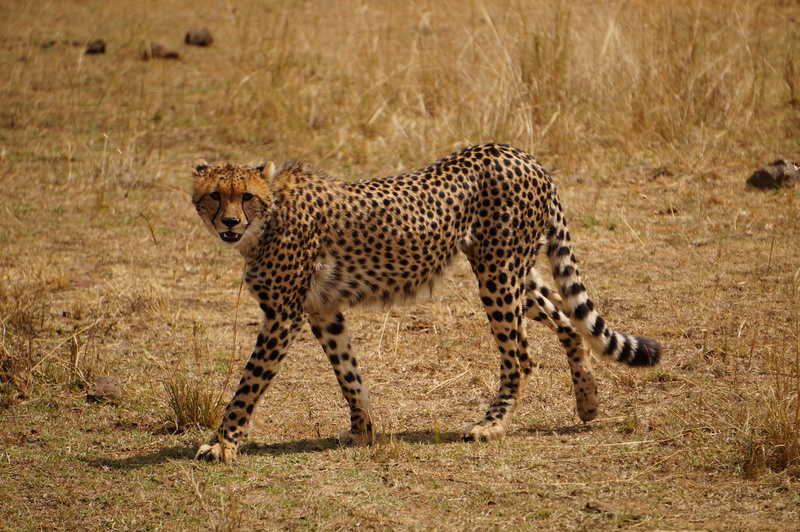 Cheetahs don’t hunt zebras since they are not as strong as a lion and zebras have really strong legs. I am not sure what this guy was thinking here but he did give a tiny chase and gave up. 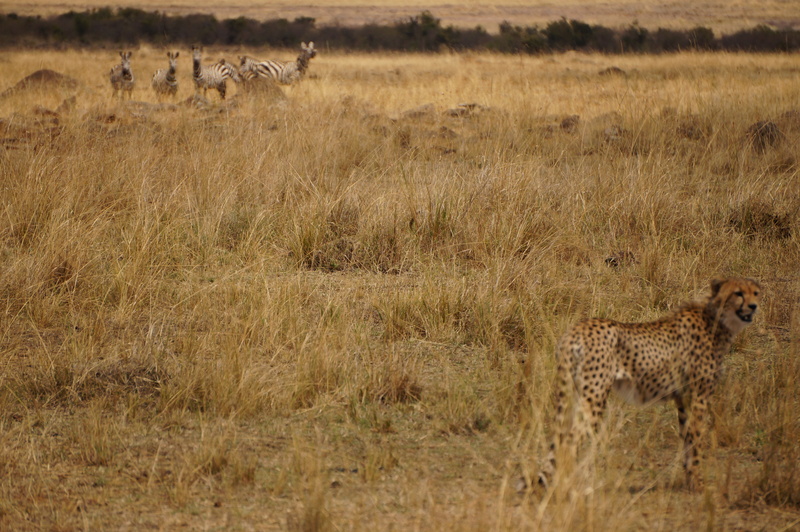 I would have loved to see it run..
We spotted a cheetah devouring a gazelle and I managed to catch some good bloody pictures. 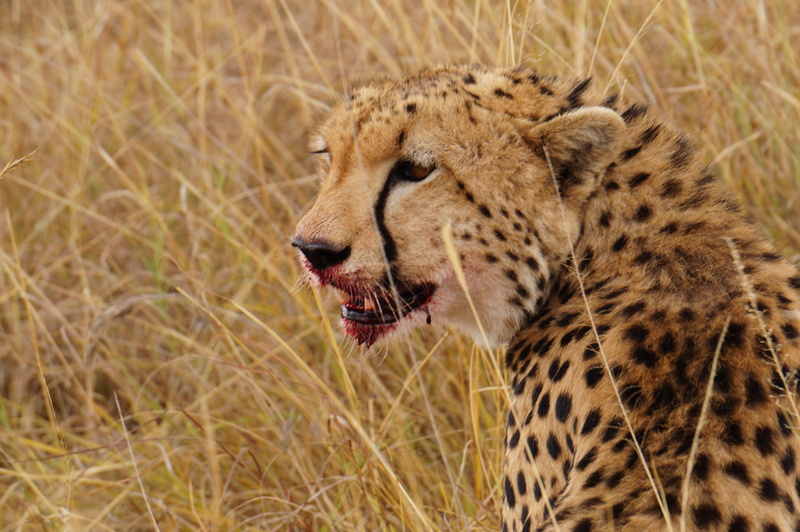 Cheetahs are known to only eat their own fresh kills unlike hyenas or even lions who don’t mind making a meal out of some other predator’s kills. If you like watching movies with the man-and-animal-friendship theme, I would recommend watching Duma.. heartwarming and simple. 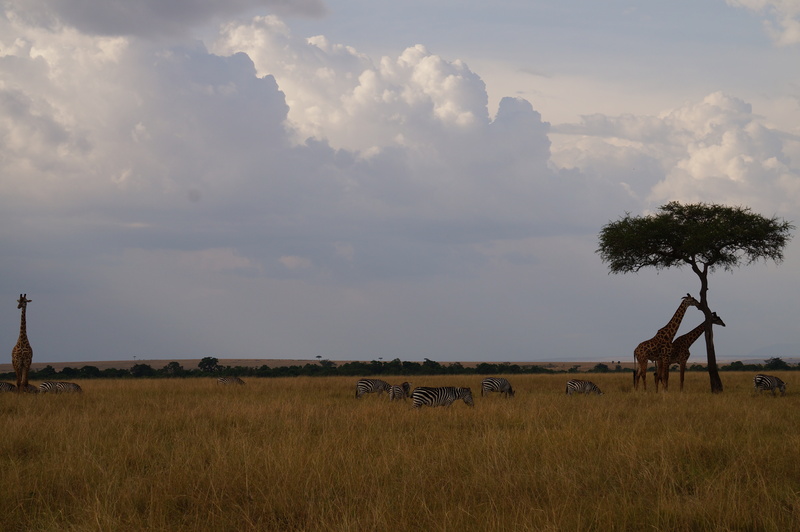 Hyenas are plenty in Maasai Mara. I could hear them cackling while sleeping in my tent. 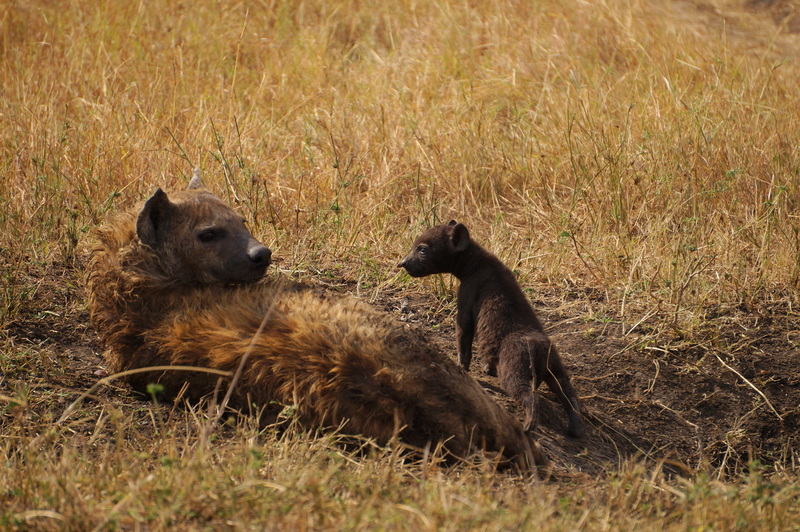 Apparently, a baby hyena is a rare sight and this seems to be few days old. 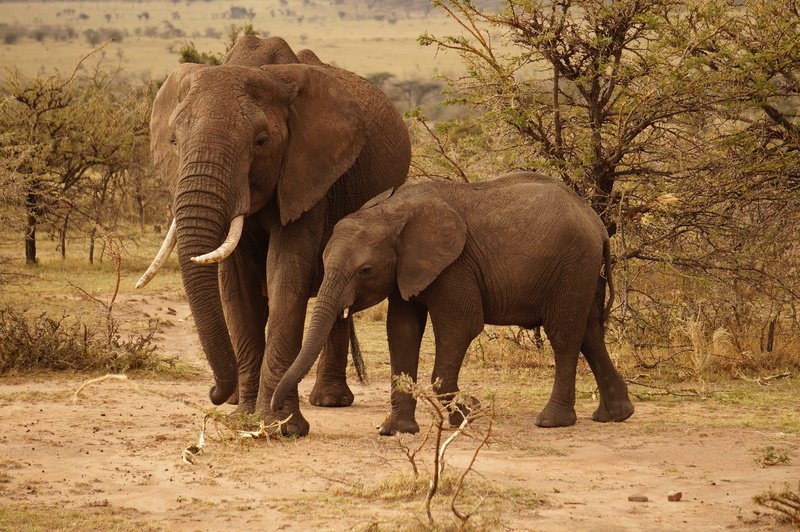 Now that we are talking about babies.. take a look at this baby elephant. I never thought how beautiful plains can look. 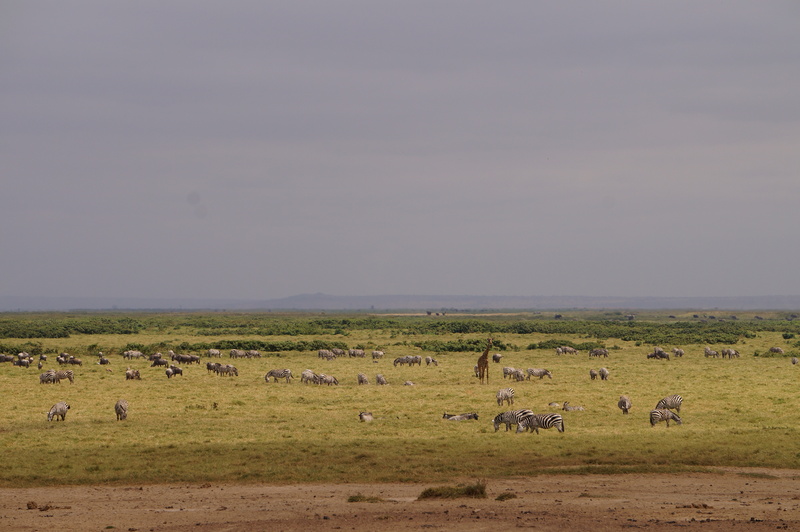 The endless yellow plains of Mara is one of the most visually stunning landscapes I have seen. I still remember the very bumpy drive back to our tent in the stormy rainy weather.. it was the most beautiful, reflective journey and I hope I can relive this again. My day was about to end and my guide was taking the route to drop me off. 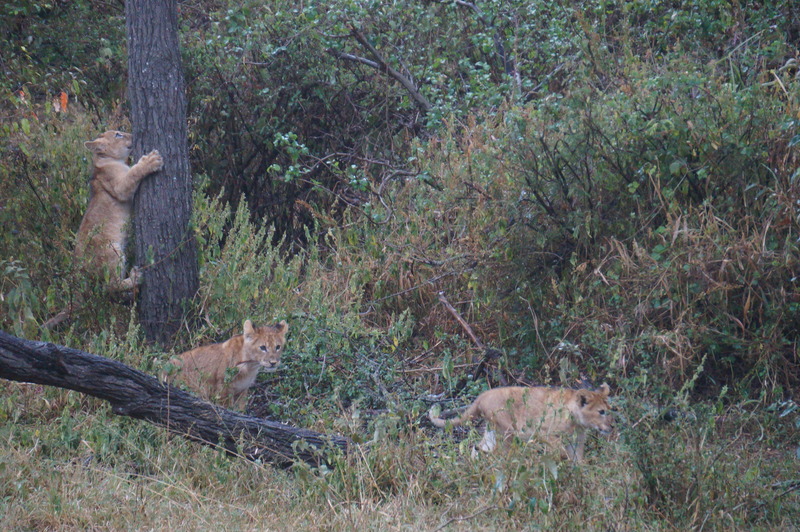 I had given up hope of catching sight of the elusive and shy leopard. A few minutes away from our next stop, we started hearing monkeys shouting. 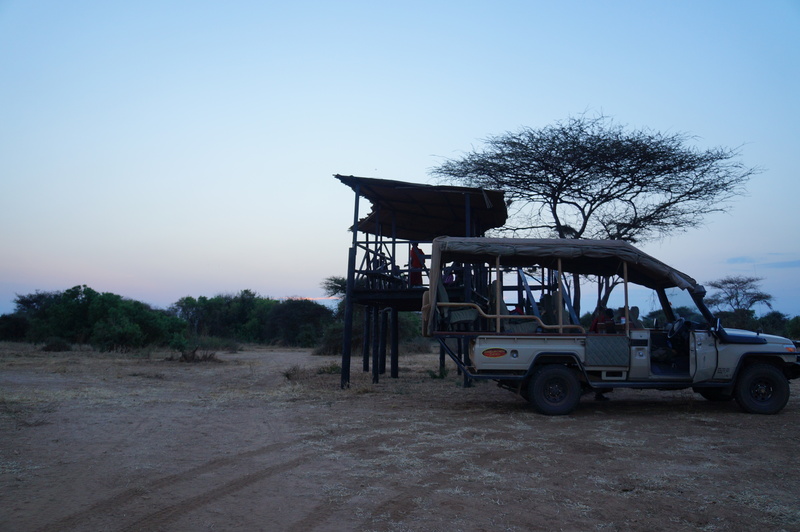 Our knowledgeable guide immediately pointed out there is a leopard around and the shouts are alarm calls given by monkeys alerting each other. The photos are very shaky but here is one. I was told we were very lucky to spot one. 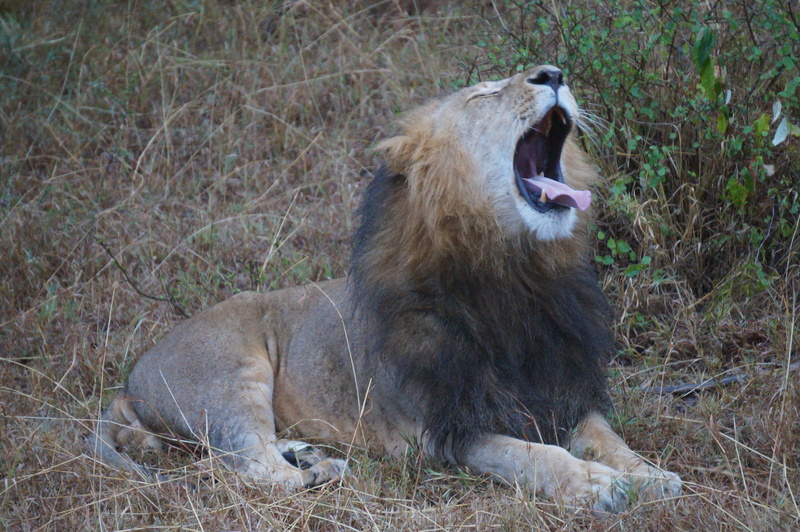 My last day in Africa started with an early morning game drive. I was really excited to catch the sunrise and it was as beautiful as I thought it would be. This post has been few months late in coming but I am surprised how its all fresh in my mind. How I still really want to be back there again. 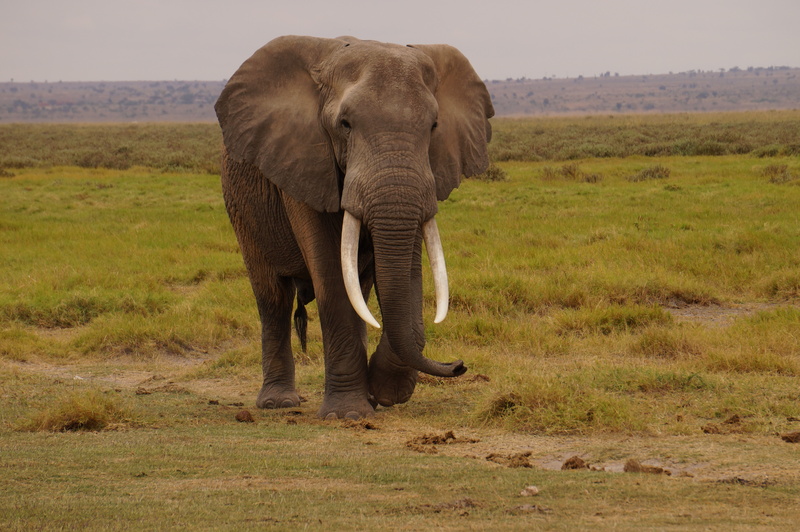 I am sure there are plenty of experiences I haven’t witnessed but being out in the wild is exhilarating and makes you realize how there is so much more in this world than just you and me. 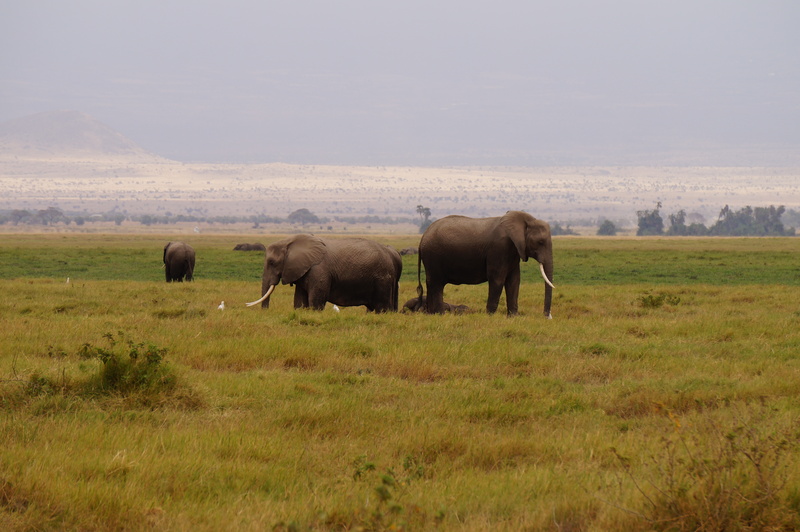 My African safari adventure started with Amboseli, famous for its elephants sightings and views of Tanzania’s Mt Kilimanjaro. 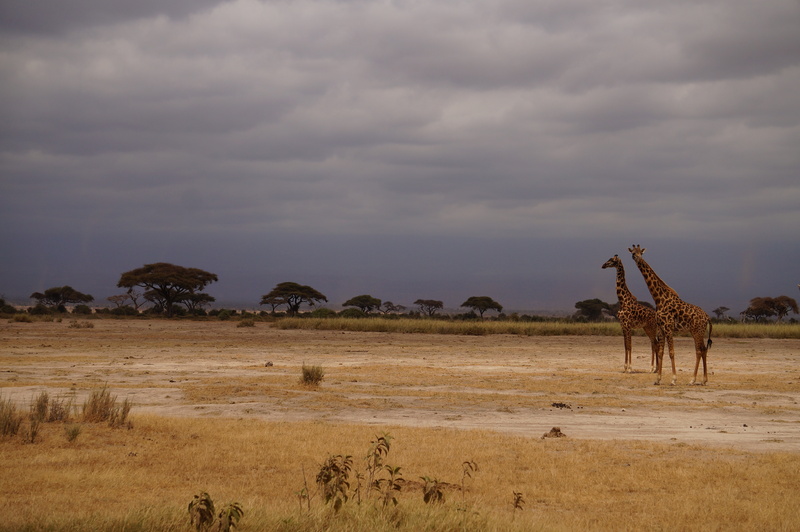 The weather was cloudy when I got here so I missed out on seeing Mt Kili clearly. Despite that, it was still nothing short of amazing. 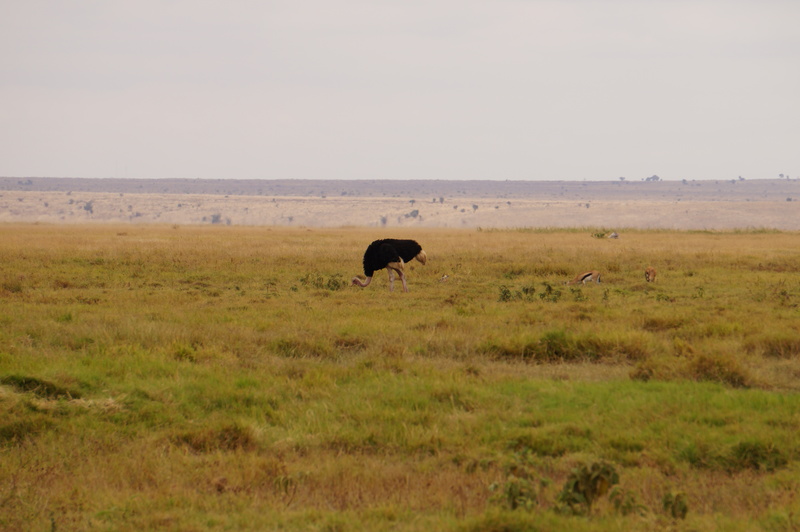 The pictures here are from Amboseli conservancy (land owned by the local community) and the national park. 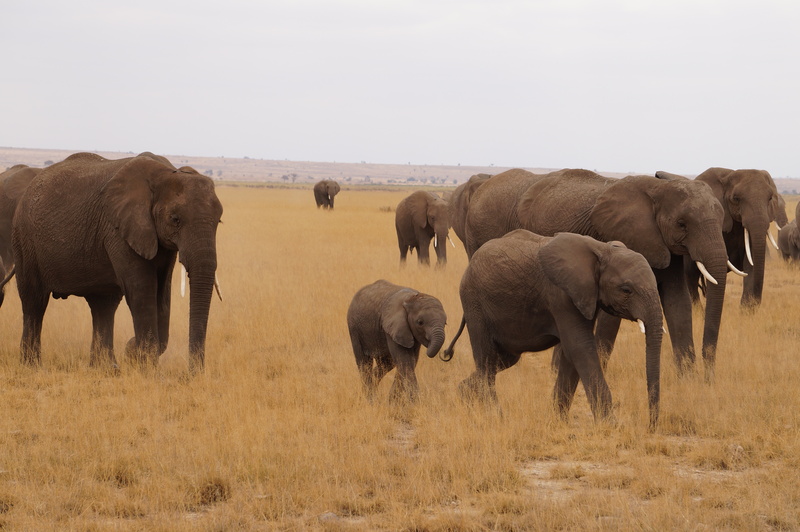 I saw plenty of wild elephants (woohoo!). They are distinguished from their Asian brothers primarily by the shape of their ears. 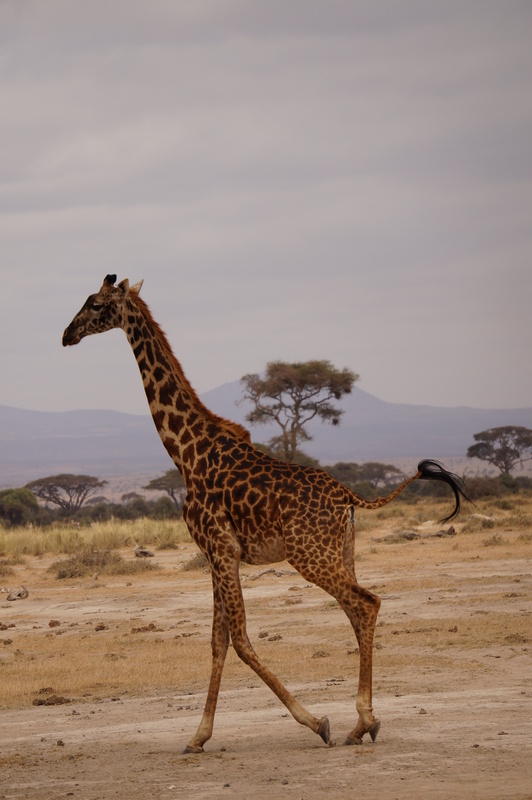 Plenty of Giraffe, Zebras, Wildebeest sightings. This picture shows all of them in one shot. 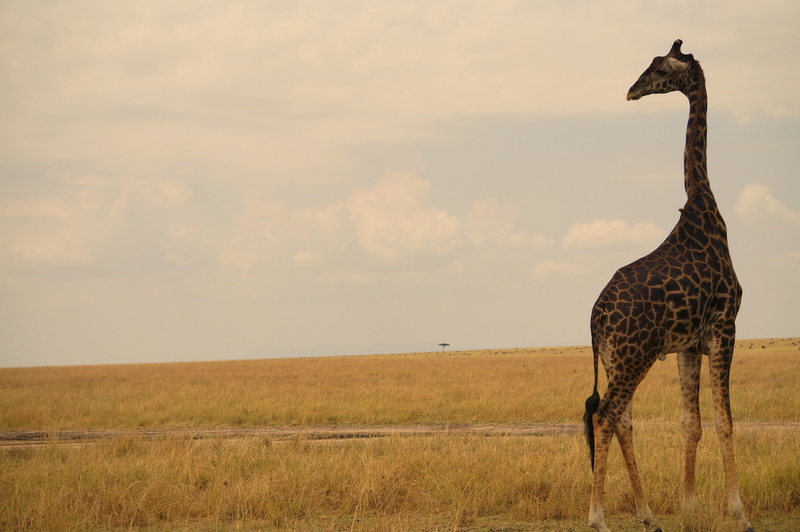 Giraffes – They look so calm and at peace all the time. It’s like they know they are in a beautiful place and all they want is to enjoy it. 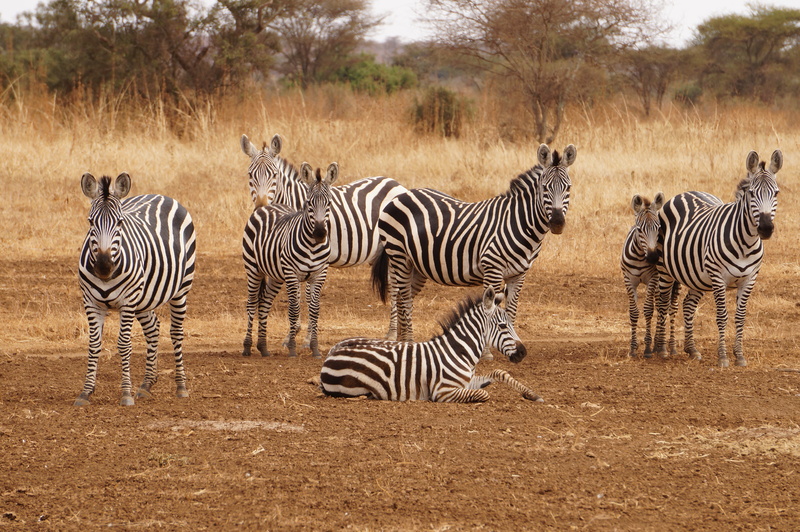 Zebras. 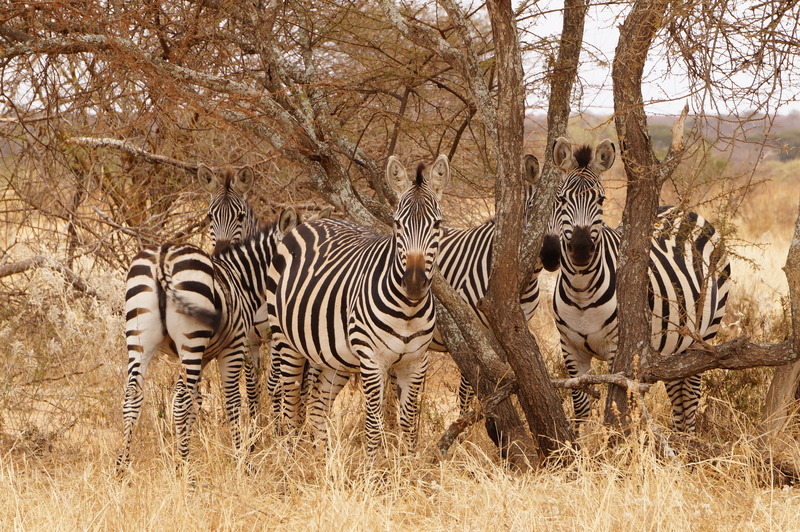 Unlike most of the other animals that seem to camouflage well, these stand out. 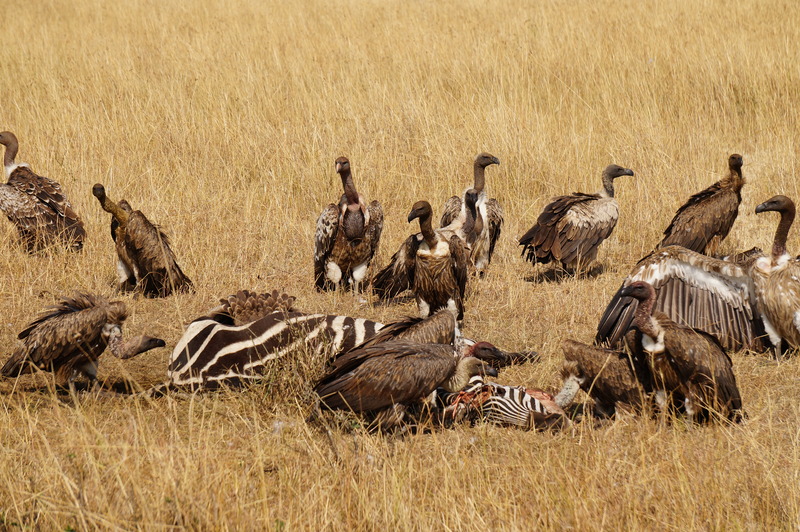 But their powerful legs and sticking together mentality also makes it difficult for predators to hunt them. 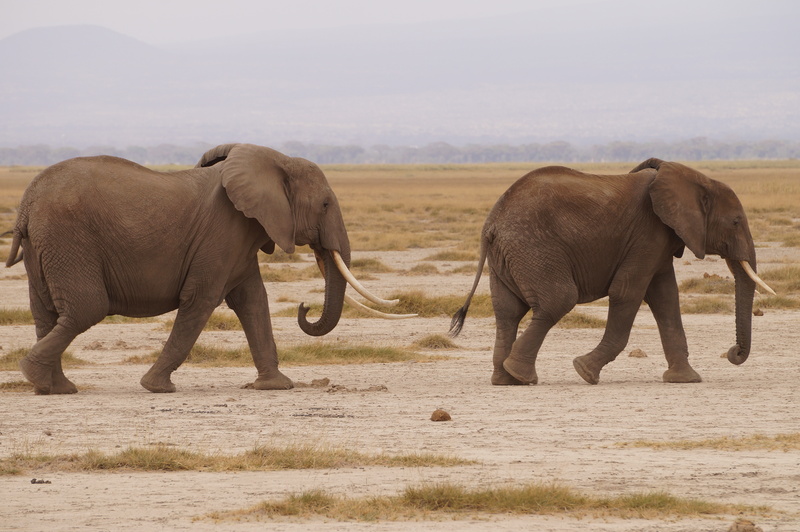 Big 5 – a term constantly thrown around during my trip – is a list of 5 animals that are most difficult to hunt on foot. 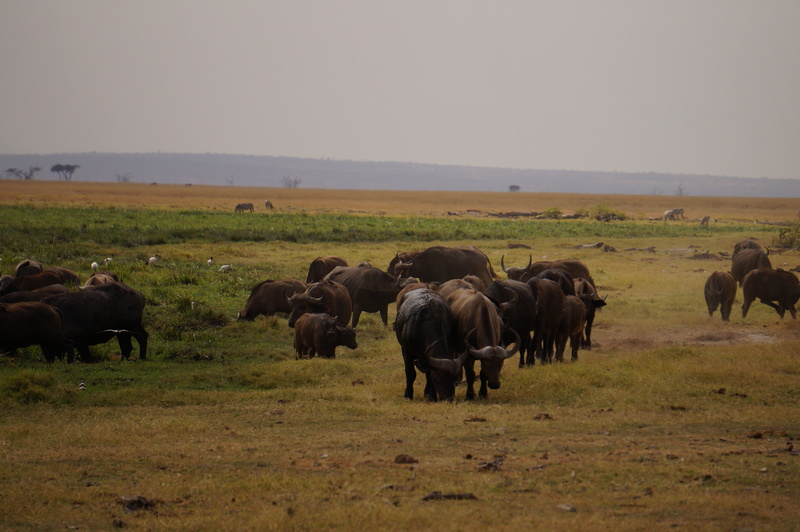 Cape buffalo is one of them. 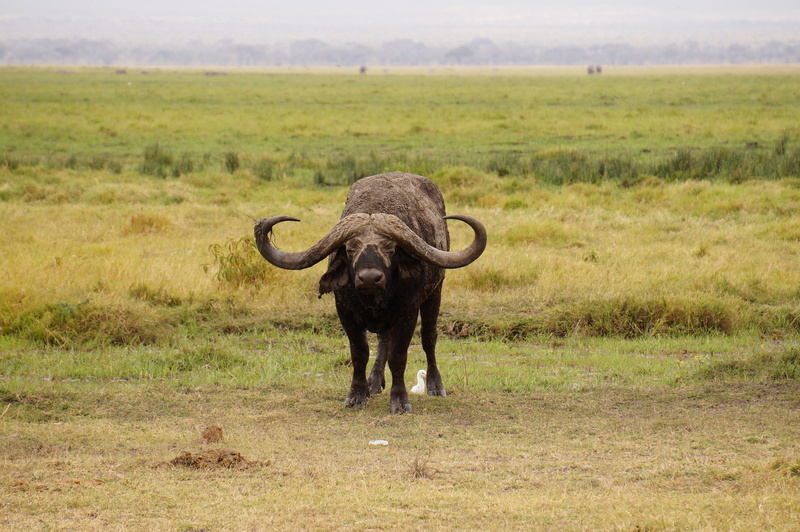 Their horns are made of keratin, just like our hair. 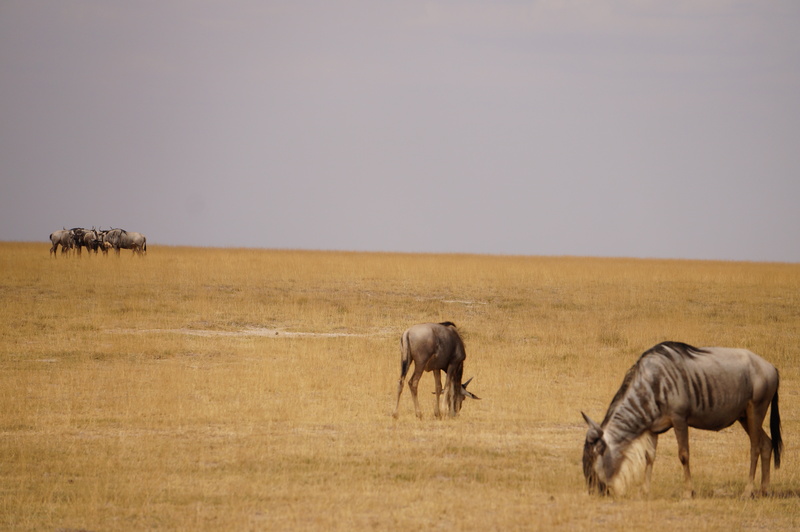 Resident wildebeests who are not part of the famous wildebeest migration. 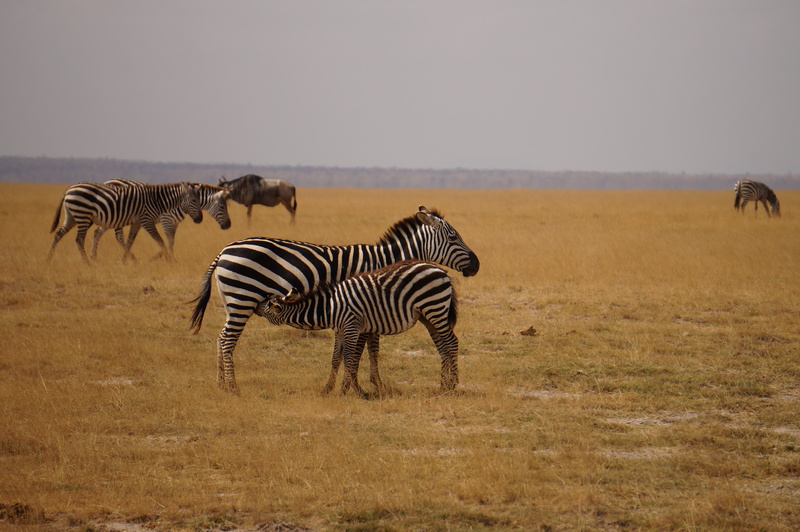 Our guide mentioned how they look like they have been assembled from features of different other animals – stripes of zebra, goat’s beard, buffalo horns. 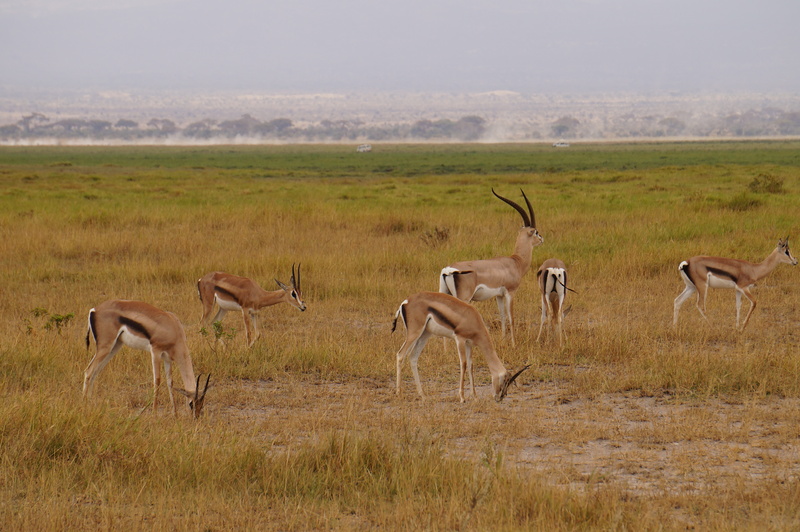 A herd of Grant Gazelles. 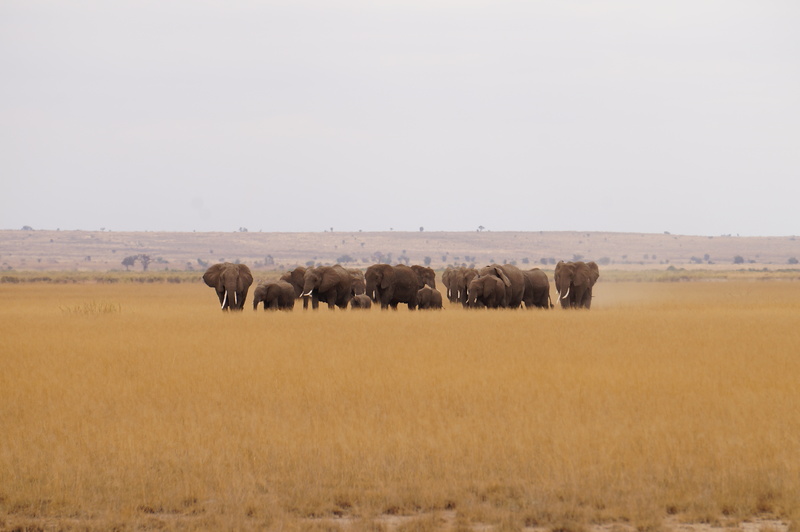 The one in the center is the male with its fancy horns and the rest are his wives – “Harem” herd is what my guide said. Females tend to have smaller bodies and horns. 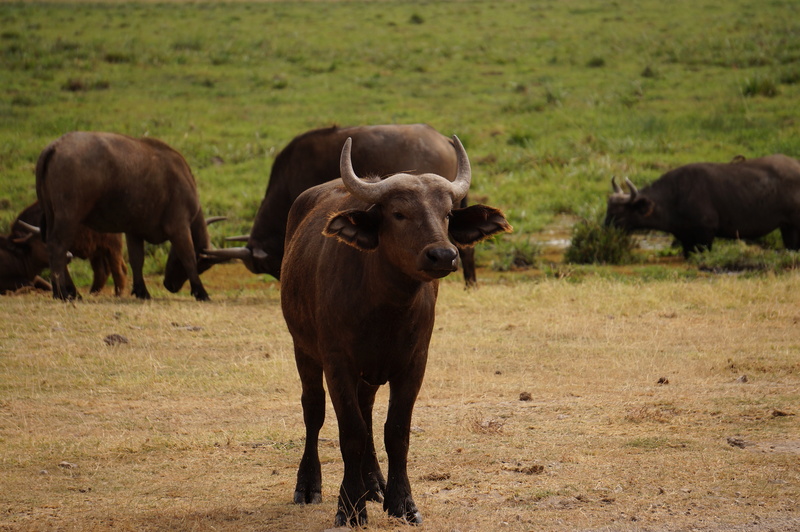 Males use these horns to fight and claim territories. 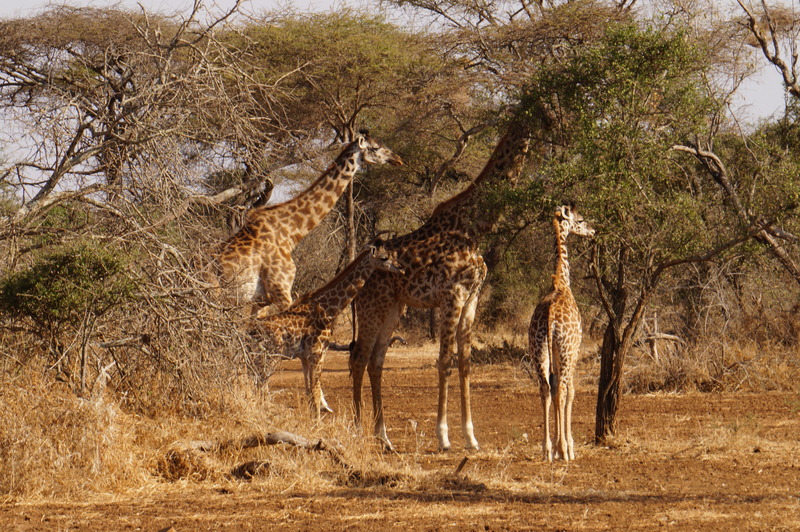 The giraffe-necked antelope or Gerunuk have long necks that help them pluck on bushes and acacias. 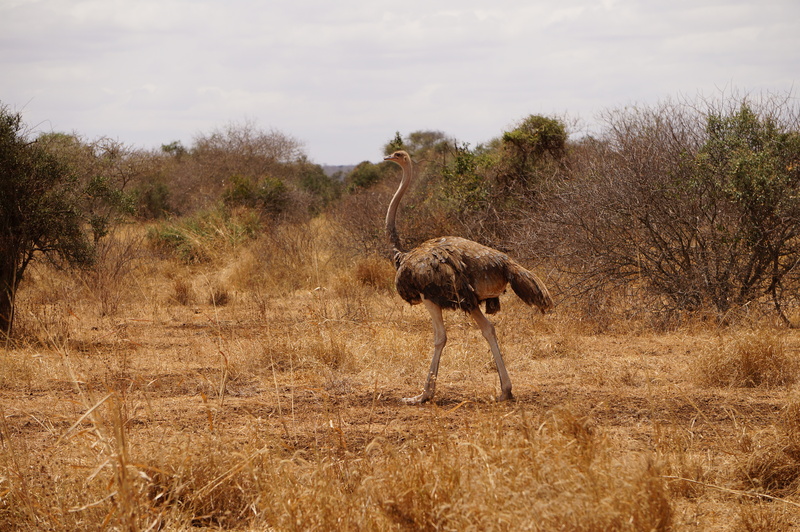 Males look remarkable with their black feathers and necks that turn pink during mating season. 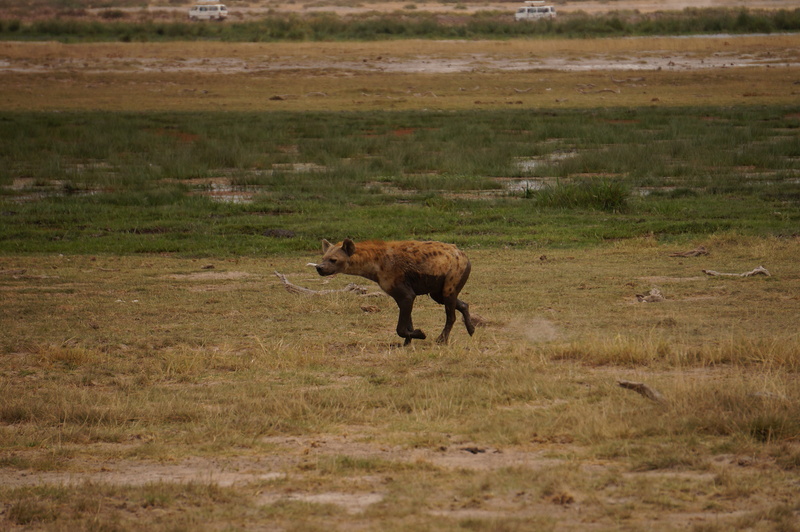 This poor hyena was limping with an injured leg. 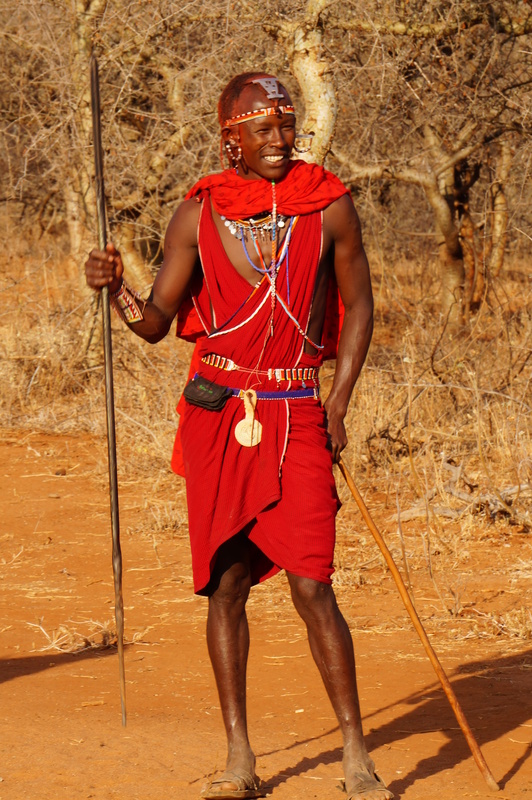 Amboseli is also home to Maasai tribes, one of the very popular semi nomadic tribes in Africa. 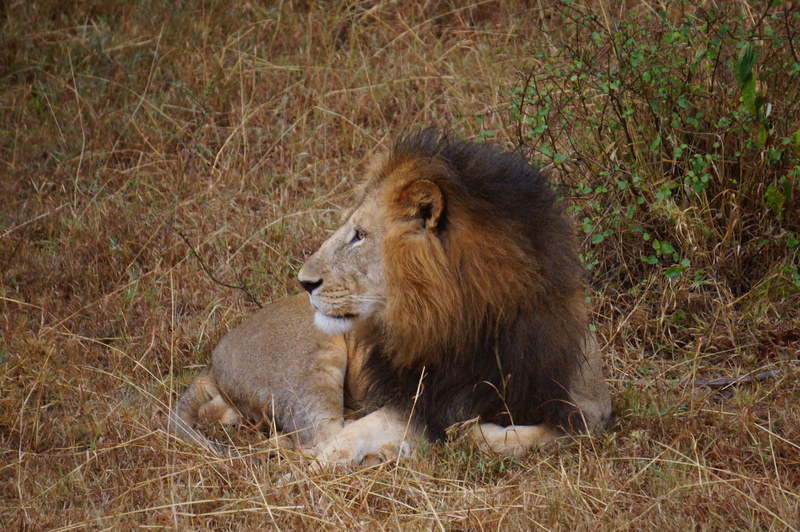 The warriors were known to hunt for lions as symbol of their courage and strength. 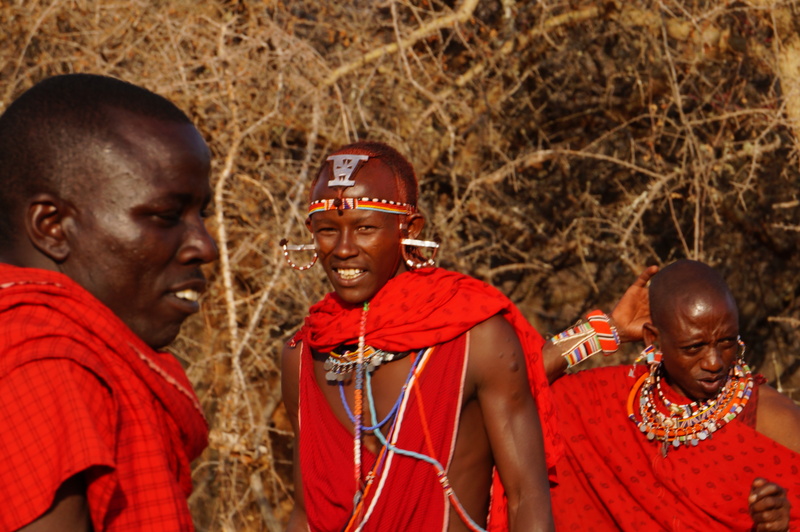 Much of their traditional lifestyle has changed with urbanization, ban on hunting/poaching & tourism. I am sure the pictures tell how incredible this place is. 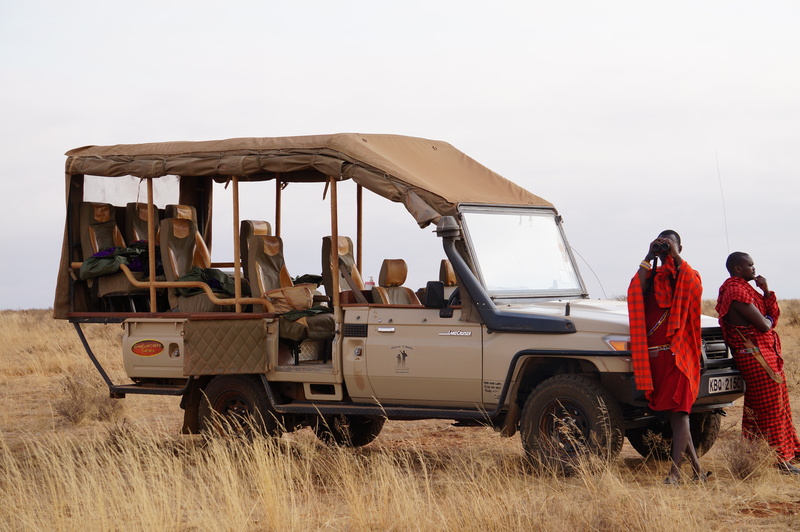 Every aspect of my experience was unique including the stay in tented camps, transfer using charter flights to/from the park, sundowners, people including staff & guides and the wealth of wild-life. I am in love with this trail. I have hiked this one twice and both times it’s been nothing short of amazing. 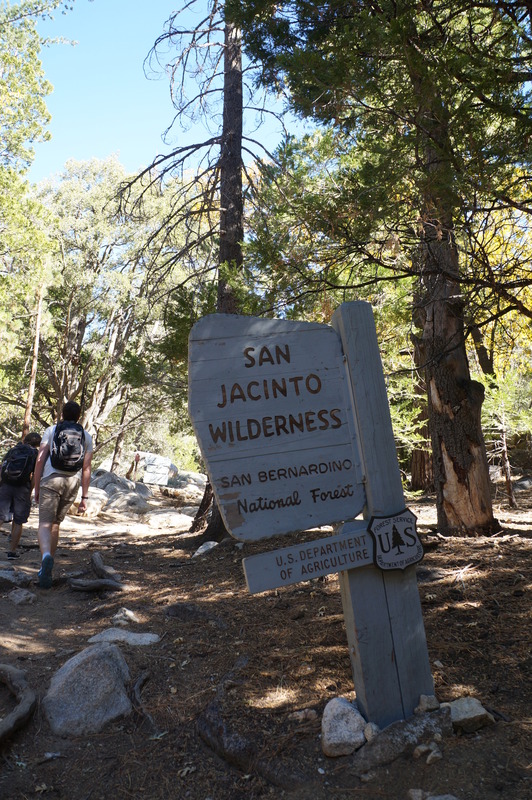 It’s a 7 mile loop trail and easy to stick to the loop if you always stay to the right (assuming you are looping clockwise). 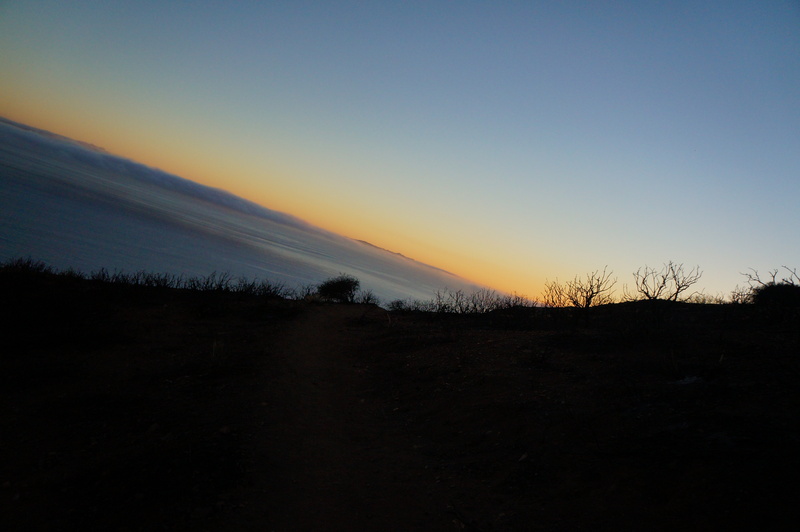 The second half of the trail is when we saw the beautiful ocean with the sun setting. 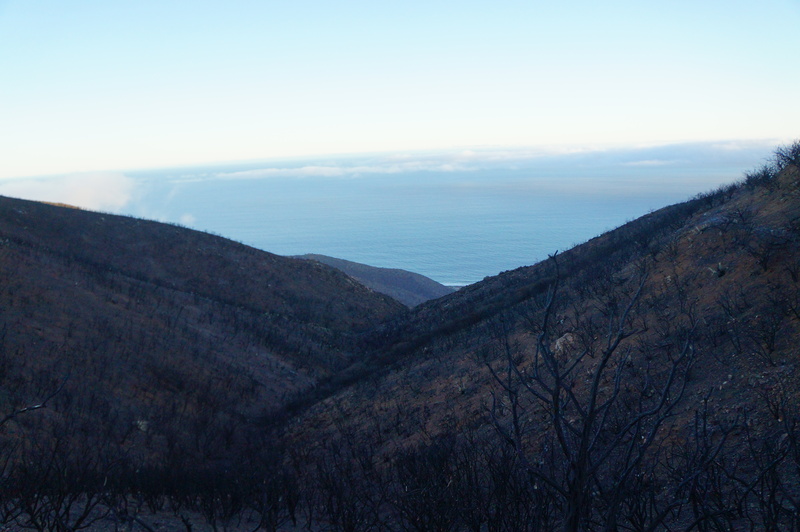 And there is more – You can hear the sound of the ocean waves… Told you, this hike is amazing at different levels. 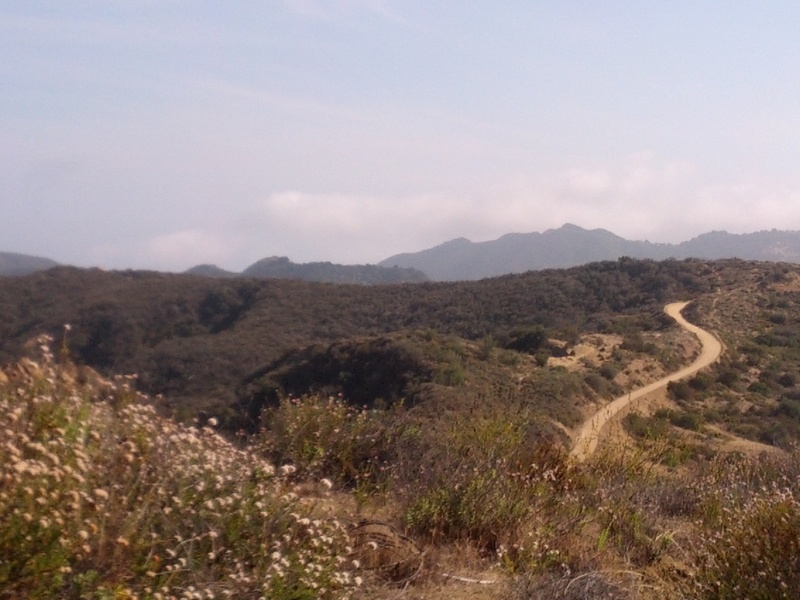 The foot traffic on this trail is minimum probably because its around 35 miles north of Santa Monica from PCH, way farther than other easily accessible trails. This post has been a week late in coming. 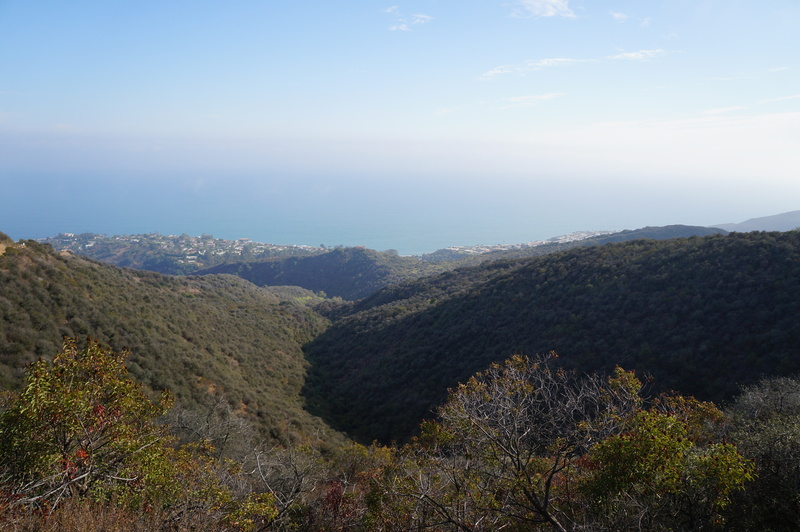 Hiked this ~5 mile trail on a clear sunny pleasant day with the second half of the trail giving us some gorgeous views of the ocean. I would recommend using alltrails map to find the loop in this trail. 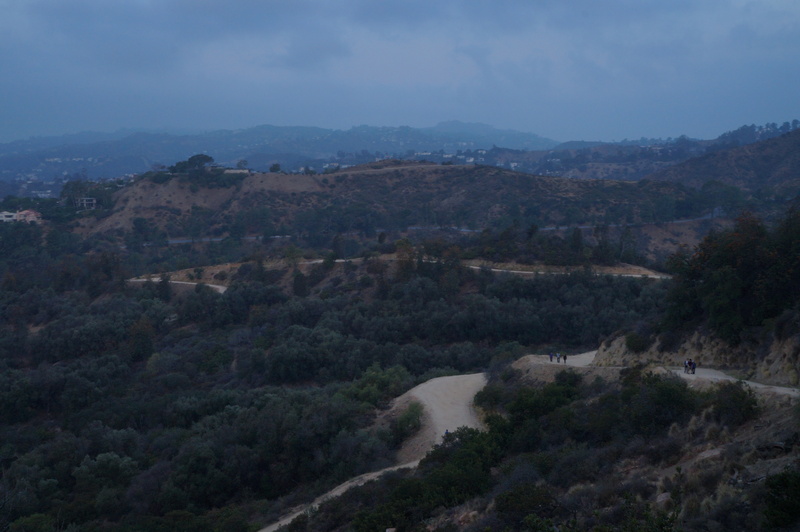 If you want a killer workout, hike this trail clockwise. The elevation is very steep for the first couple of miles. We were hiking anti-clockwise and didn’t regret it. 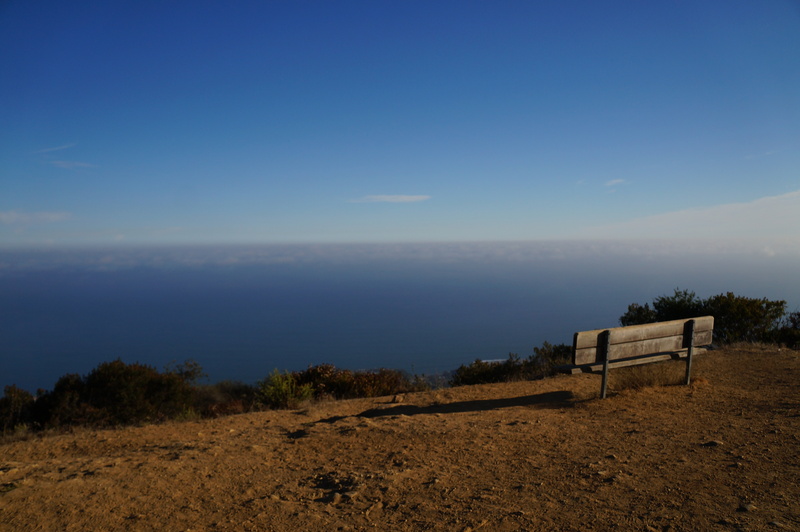 It’s something to see great views while you are going downhill with no huffing and puffing. 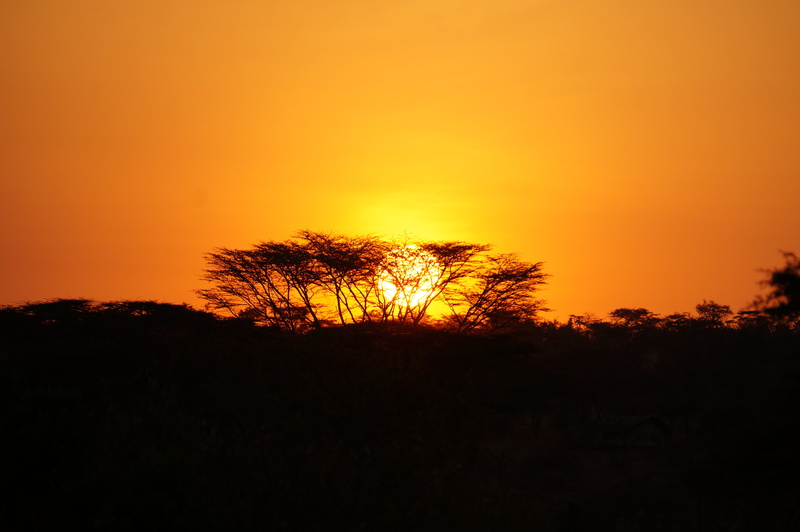 If you are like me, who wakes up early and is undecided about how to spend those early morning hours, I would recommend checking out that beautiful sunrise. 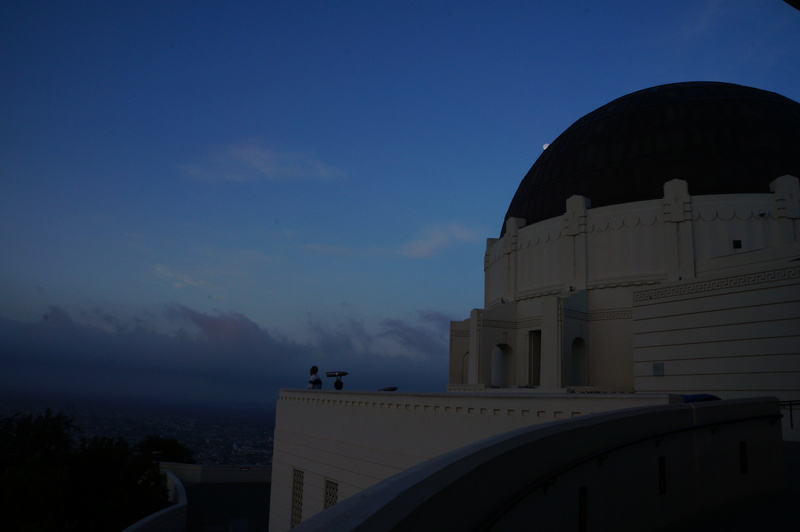 It’s difficult to find a great spot in Los Angeles for sunrise but the view from Griffith Observatory in those golden hours isn’t all that boring either. 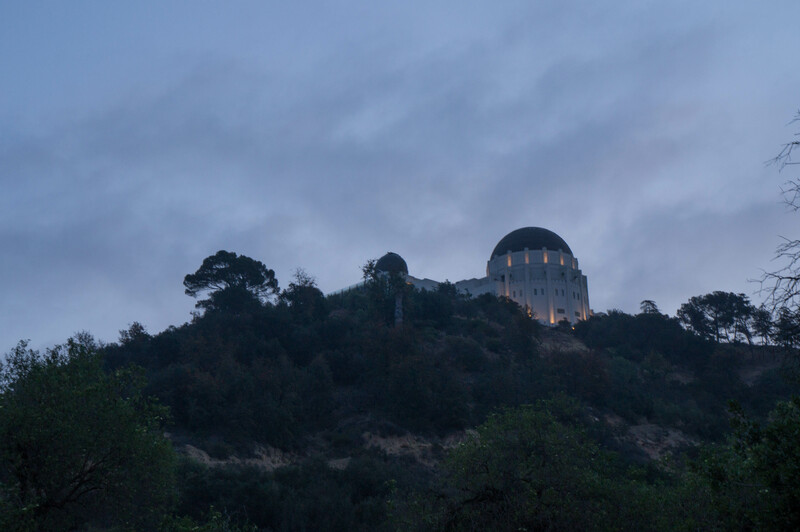 This was a short 2.5 mile, out-and-back hike from Ferndell avenue to the observatory. 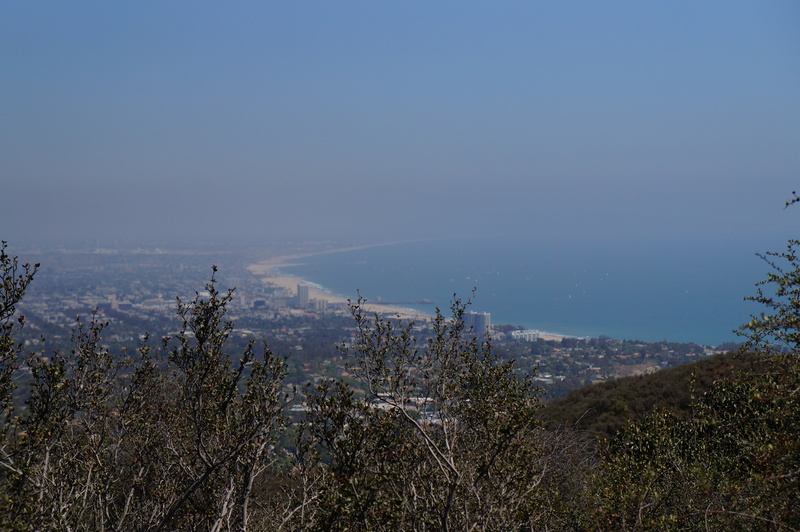 The elevation makes up for the relatively short hike making it a decent workout. 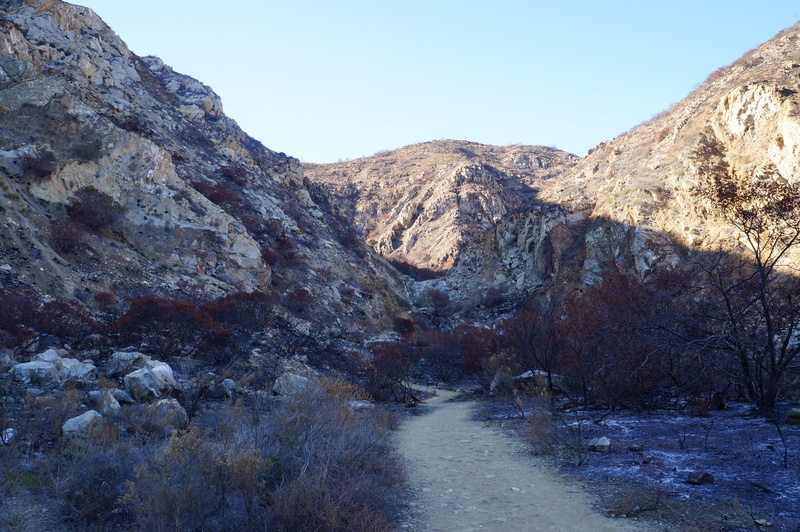 This is the basic trail; there are numerous other trails that branches off of this path; one particularly takes you to the Hollywood Sign. I would not hike this trail after 9 am; it gets very crowded around here. But this was very peaceful. 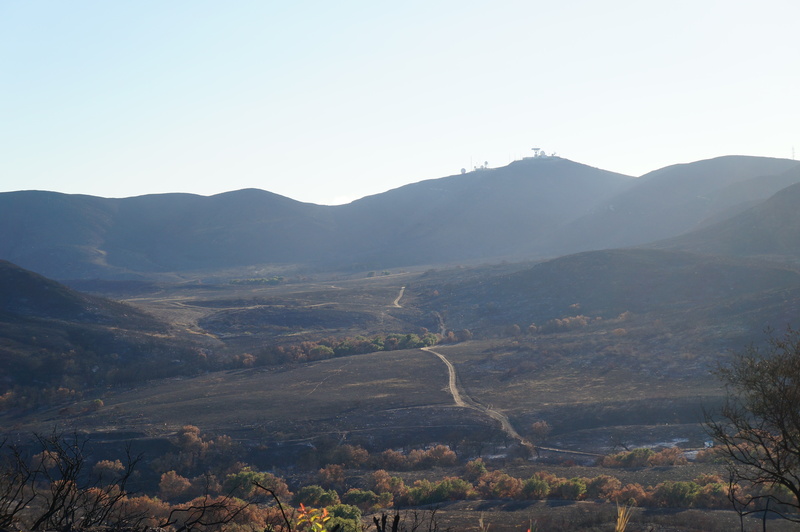 More information: http://alltrails.com/trail/us/california/ferndell-ferndell-trail. 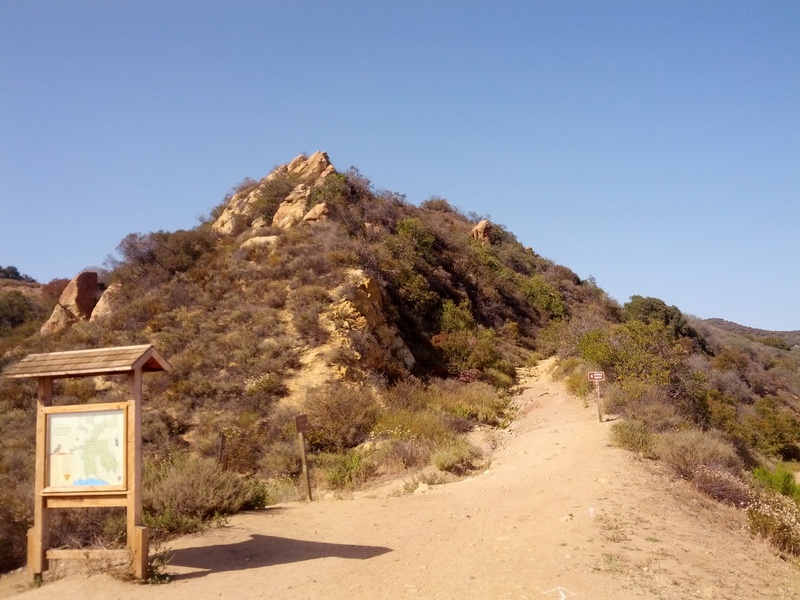 Detailed information on how to find the trailhead: http://www.simpsoncity.com/hiking/griffith/. 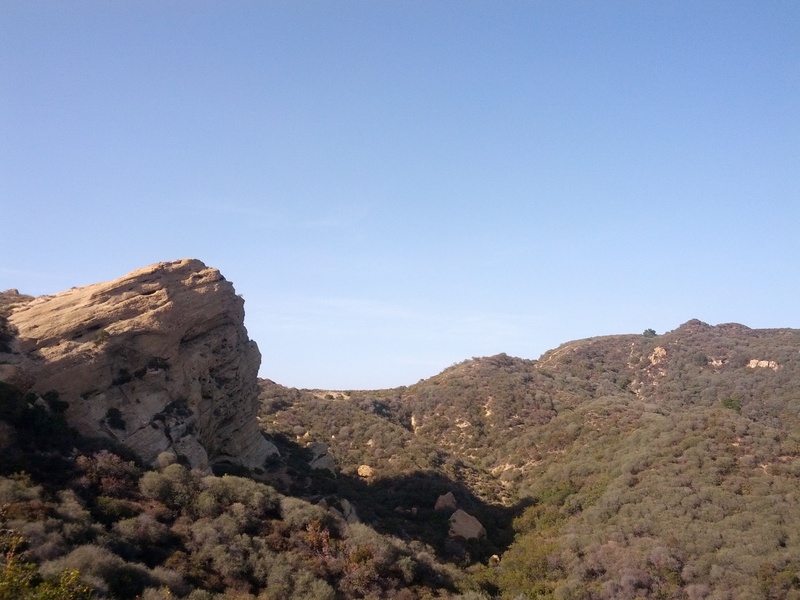 Topanga is my go-to hiking place. 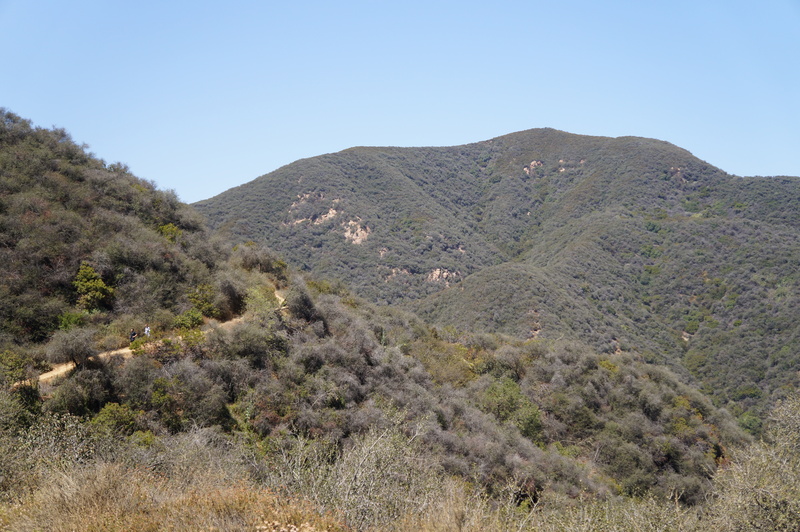 Plenty of trails with varied landscapes – if you want to walk inside woods with narrow curvy paths, choose Musch Trail; if you want some quick elevation then opt for Eagle Rock Trail; or if you prefer loops, you can start on one, merge on the other. 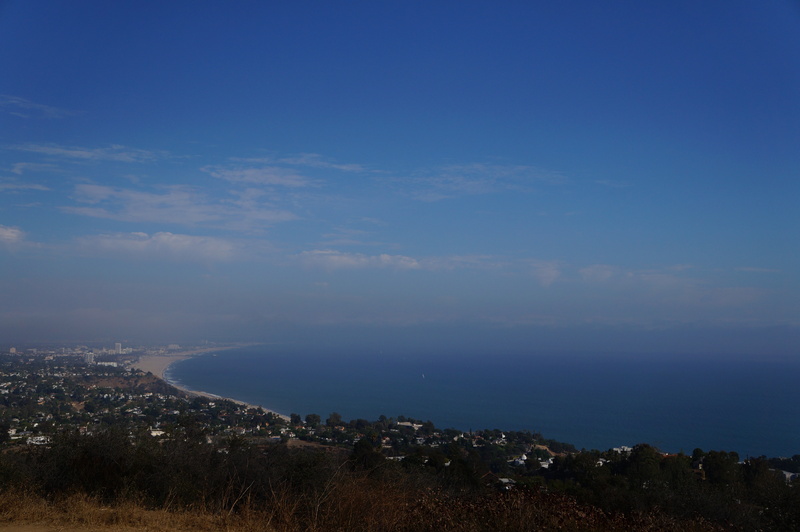 There are other trails here that I want to try – Santa Ynez & Parker Mesa Overlook are on my wish-list. 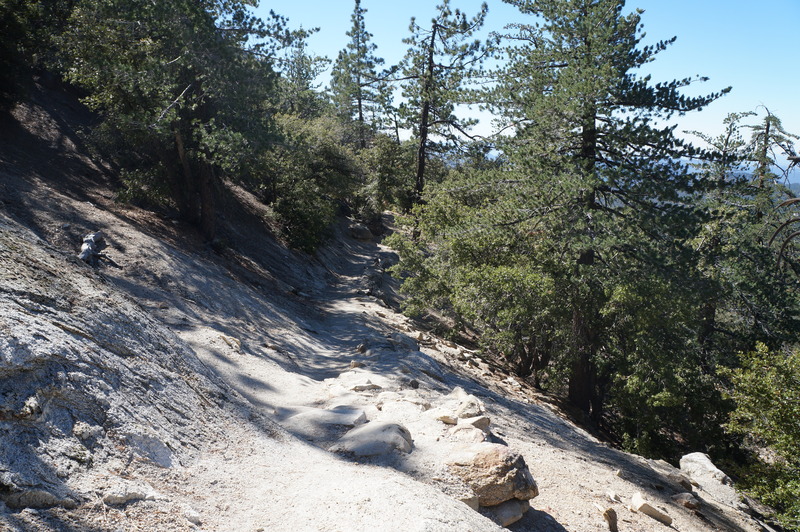 Eagle Rock is a 6 mile trail on a dirt-road with moderate foot traffic. Spotted! 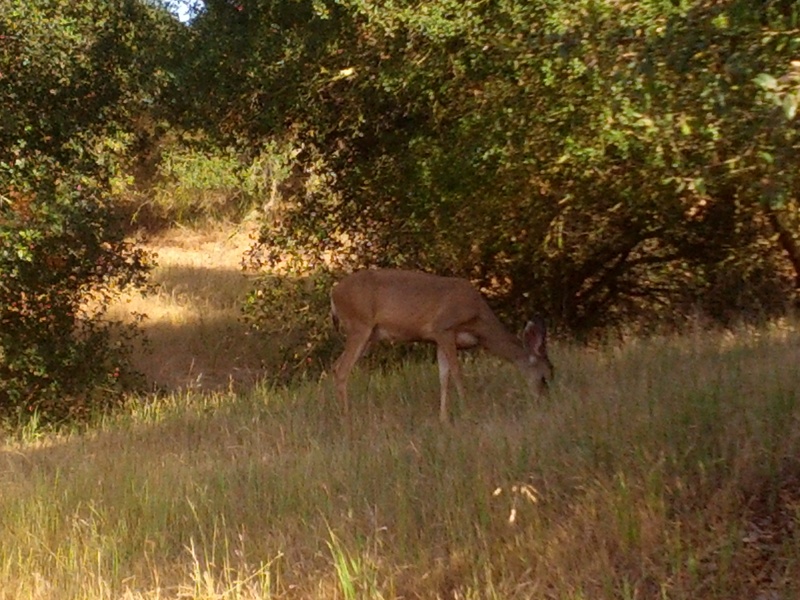 I have been having lot of luck seeing deers in the evenings around here. 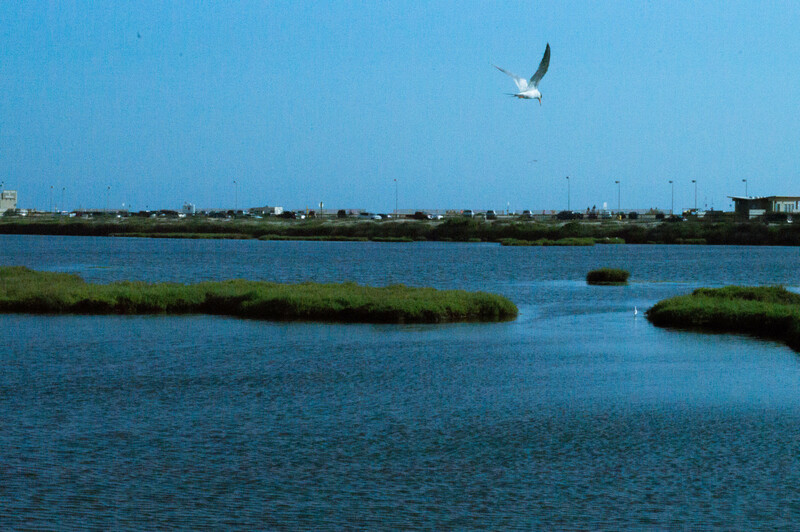 This is a wetland reserve located near Long Beach with plenty of bird sightings. 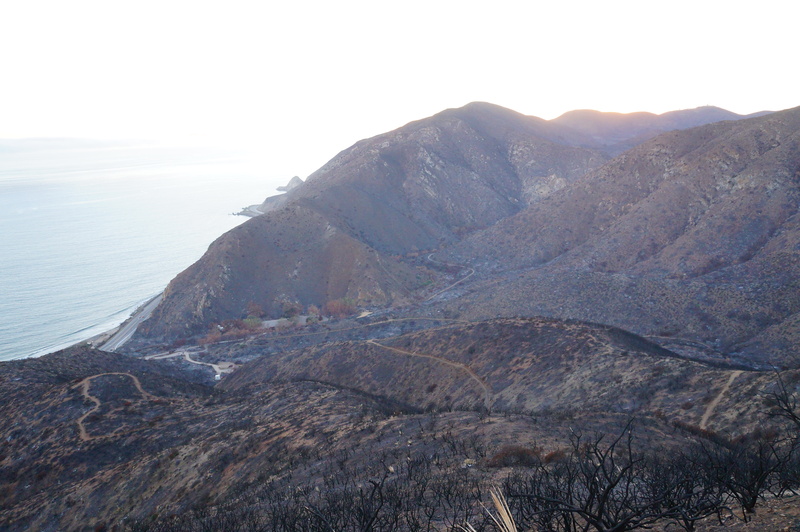 Its more of a walk on a dirt road near the beach than a hike in the mountains. 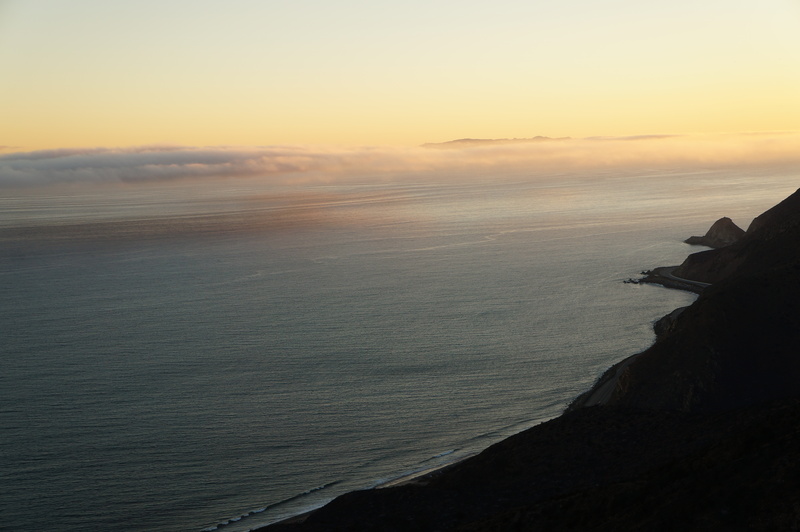 It’s not that beautiful and there is the noisy traffic from PCH. 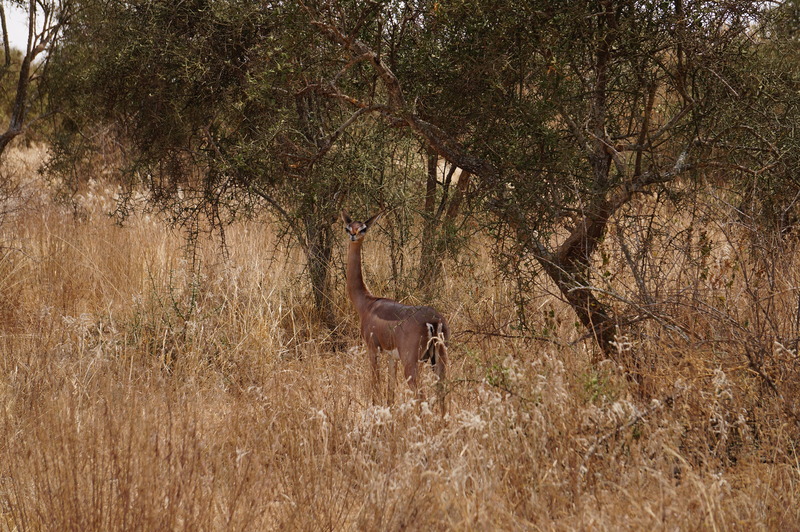 That said, this reserve hosts varieties of birds playing, chirping, diving, hunting; which made this hike very different from the usual fare. 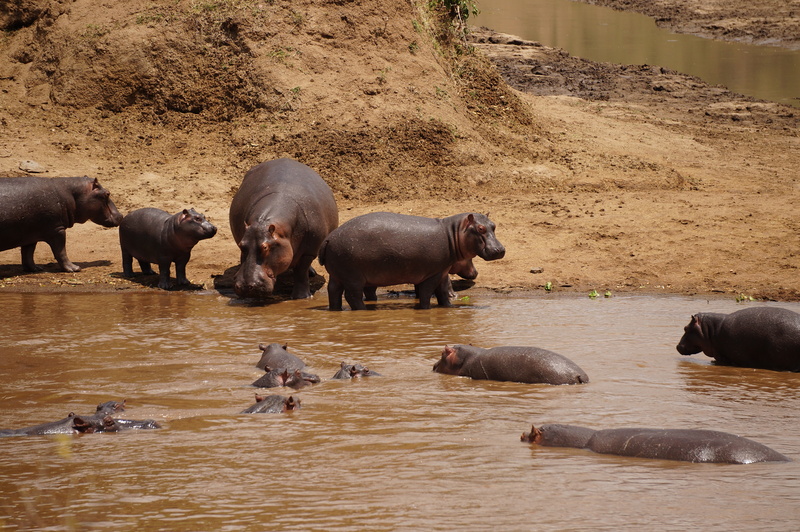 It’s a popular spot for photographers shooting wild-life. 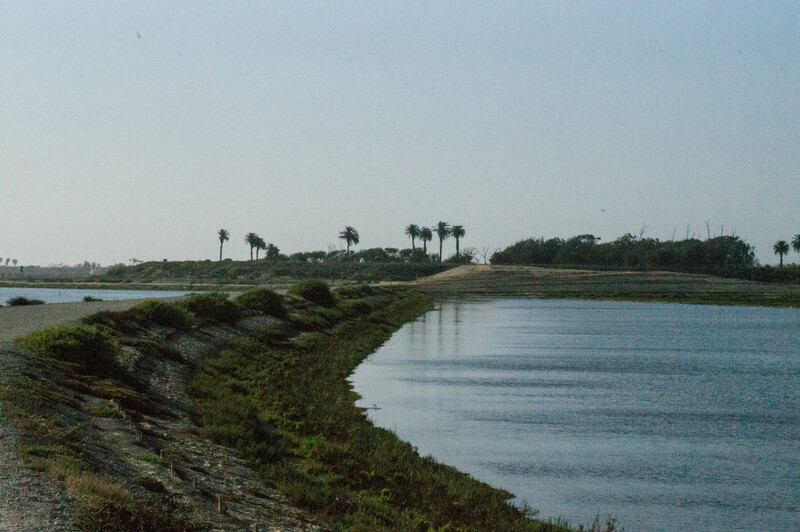 My 50mm lens did not prove enough, but there are some amazing shots posted by other photographers here: http://500px.com/search?q=bolsa+chica. I bet this place would be amazing during sunset. 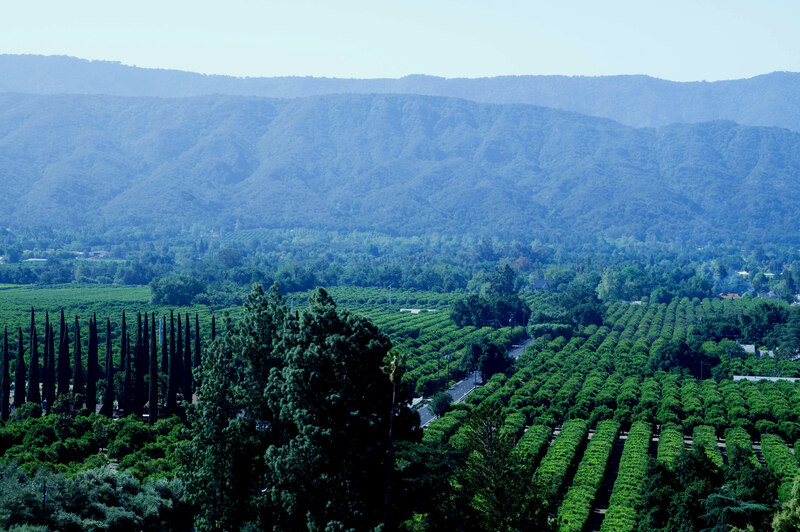 Ojai is a magical small town about 90 minutes north of Los Angeles with plenty of options to hike, bike, go horseback riding. Spending few days here was the perfect escape. 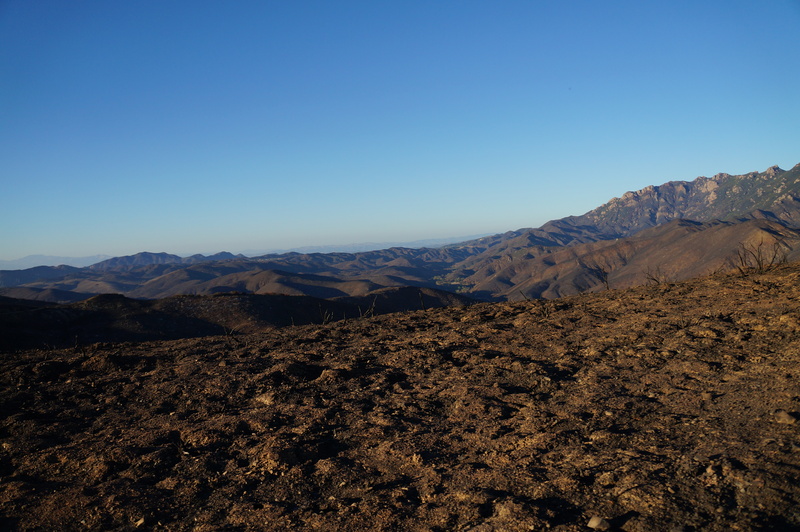 I started off with an easy trail (just around 2 miles point to point or 4 miles out and back) with splendid views of the hills. 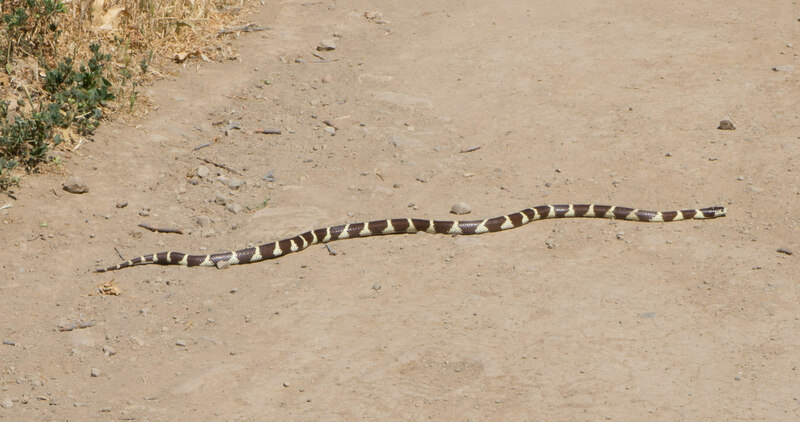 I had my first sighting of a snake on a trail. Apparently, they don’t hurt humans. 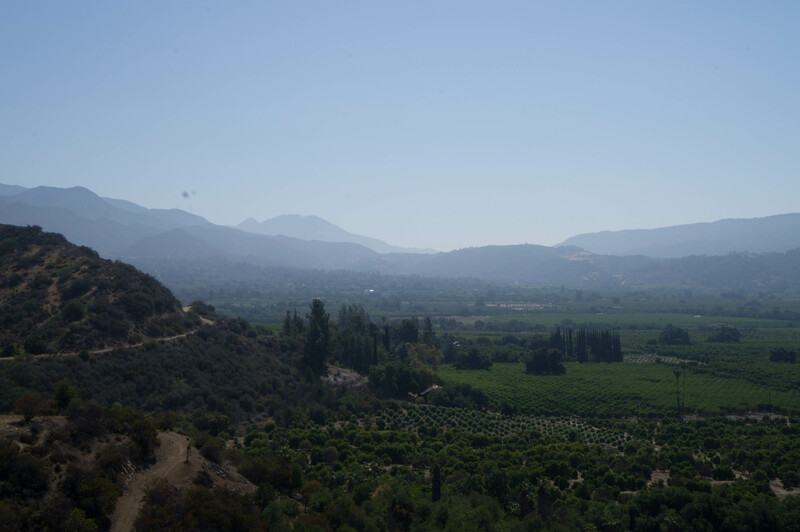 Here’s a final picture of the beautiful valley seen from the trail.